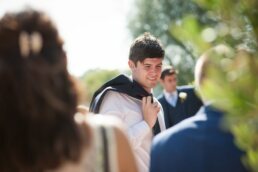 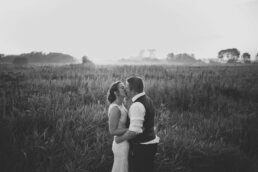 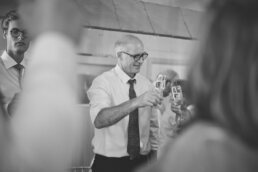 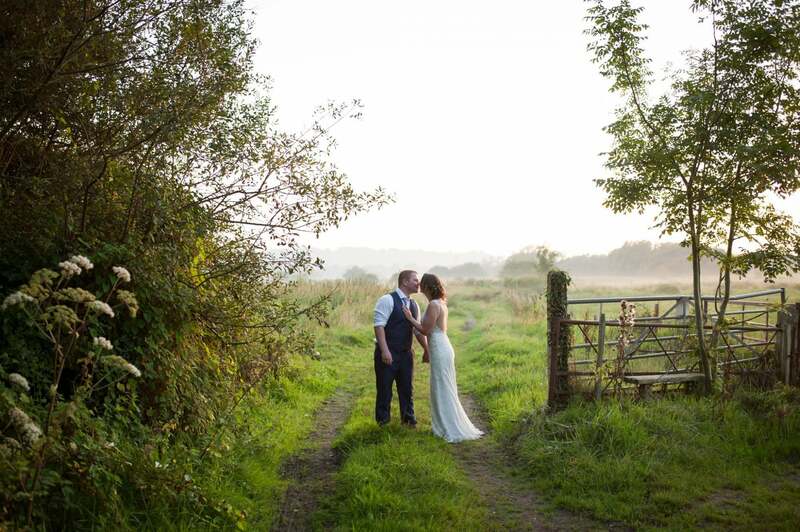 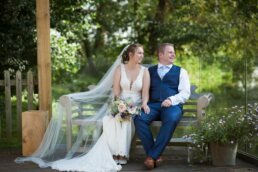 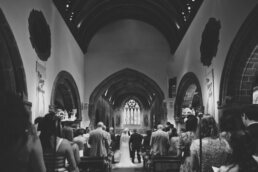 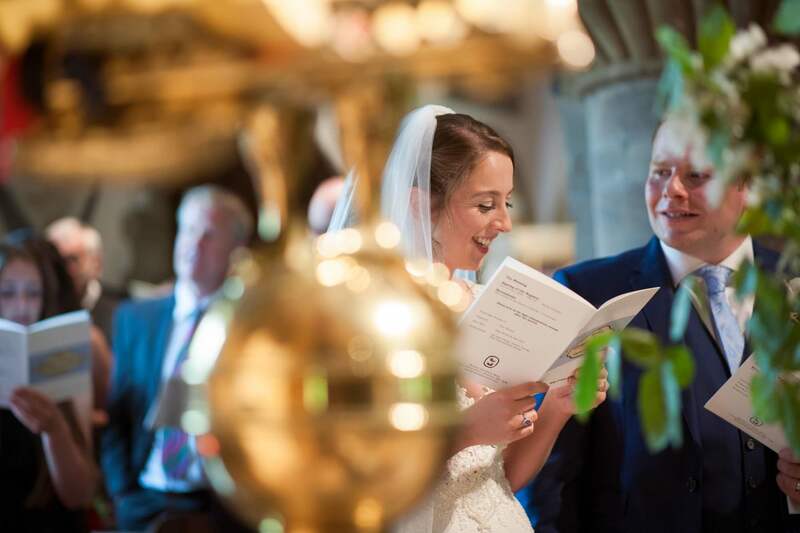 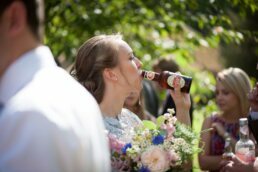 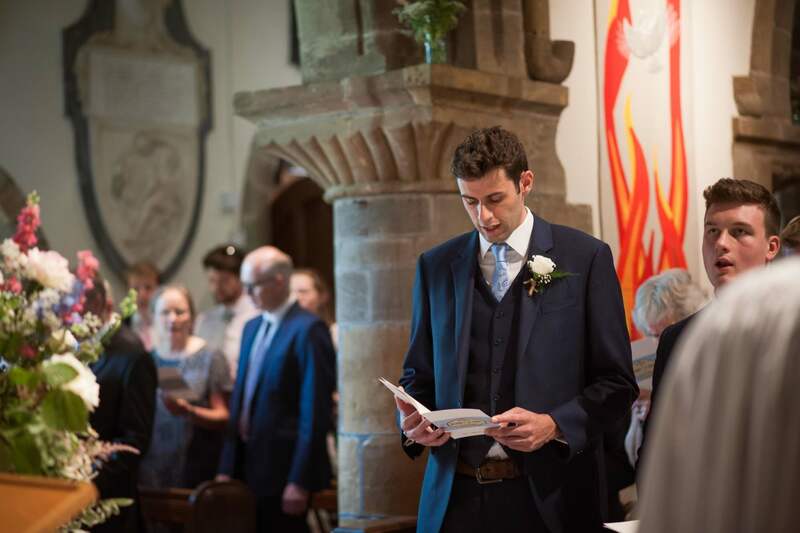 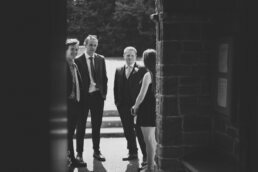 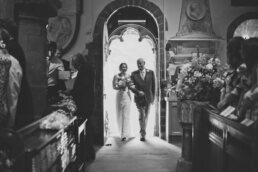 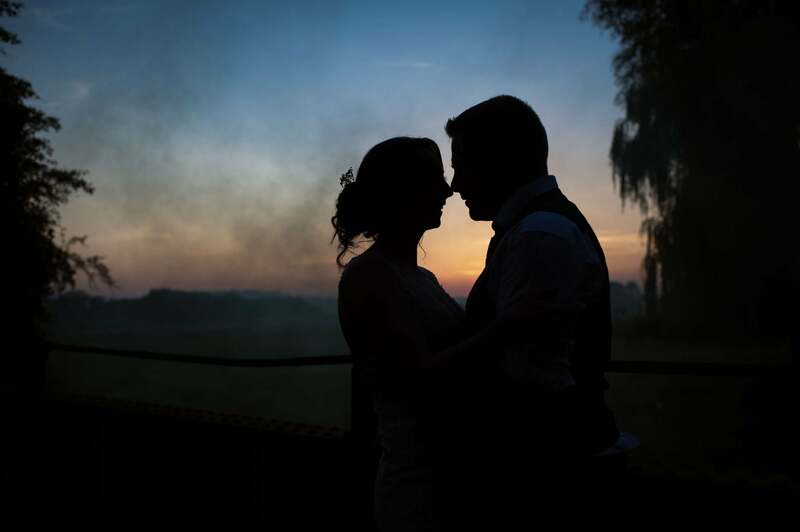 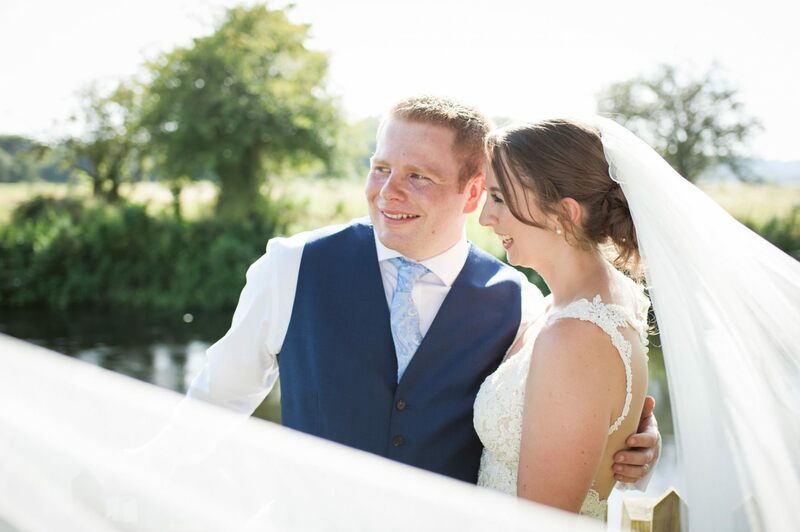 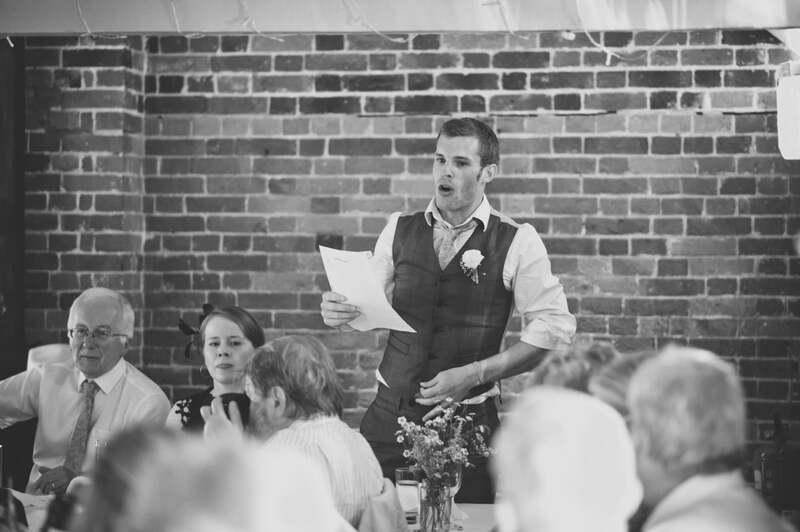 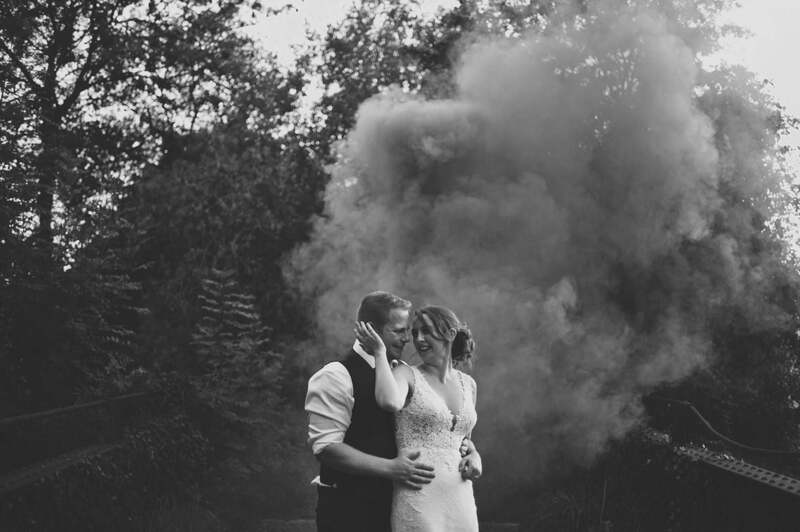 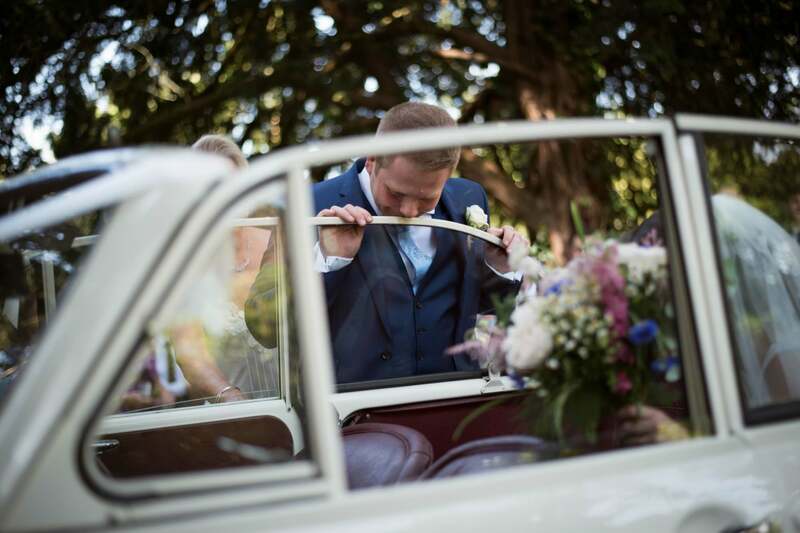 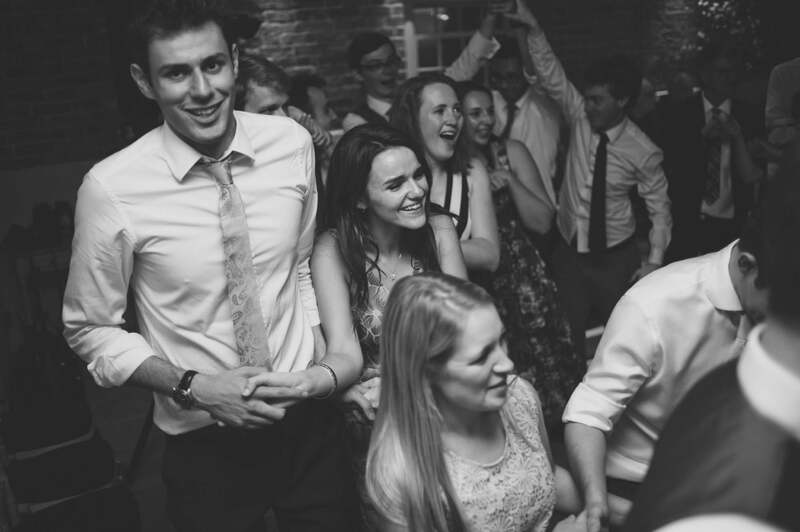 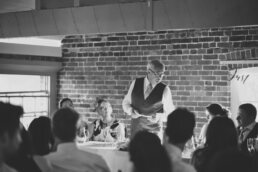 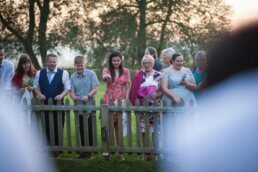 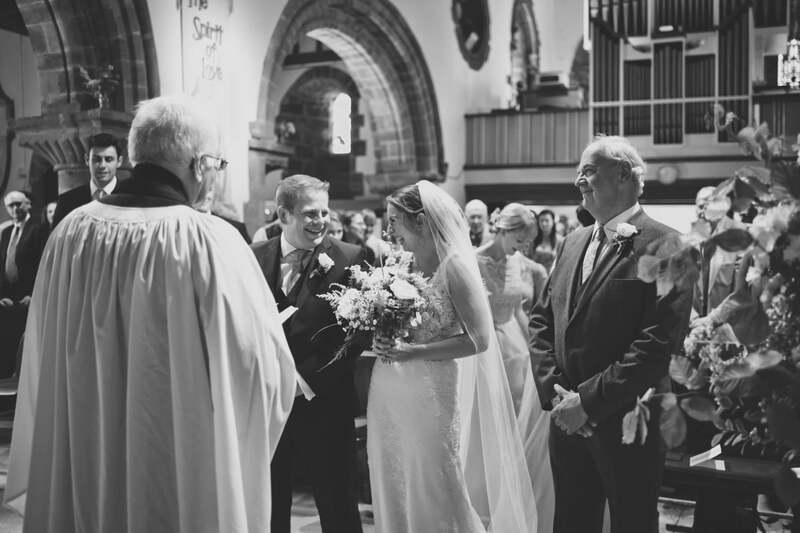 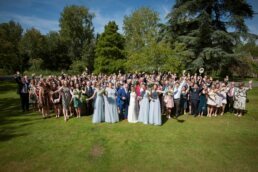 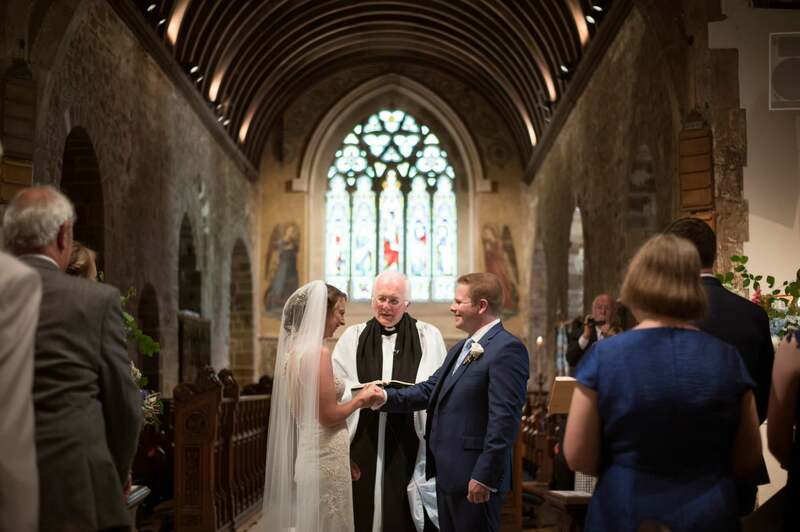 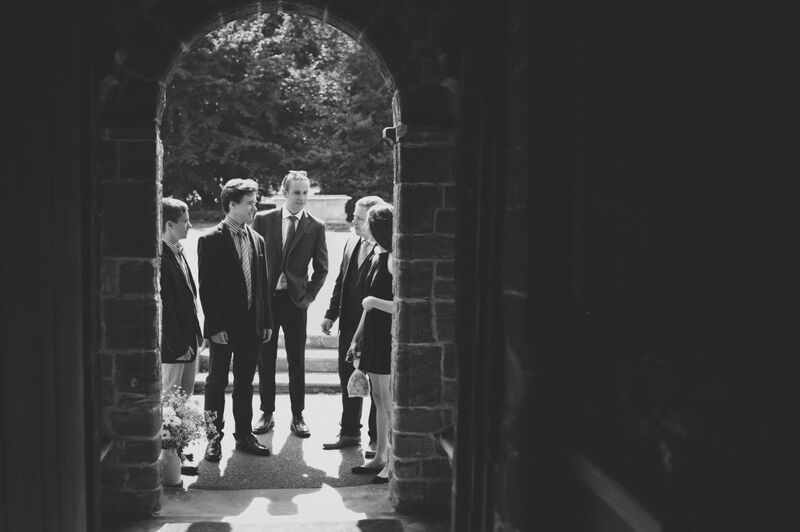 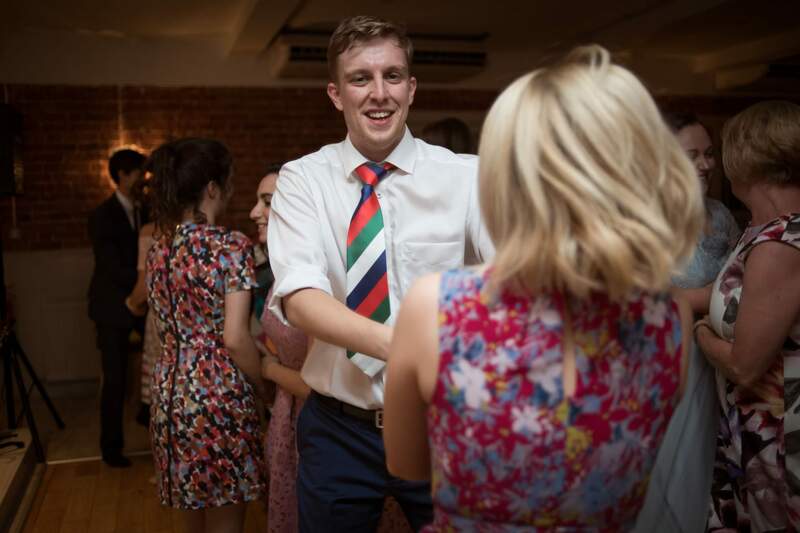 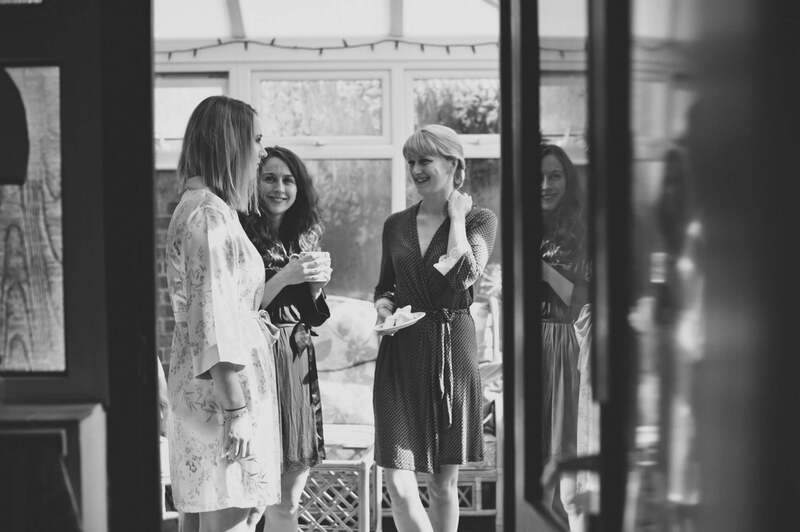 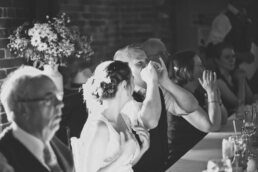 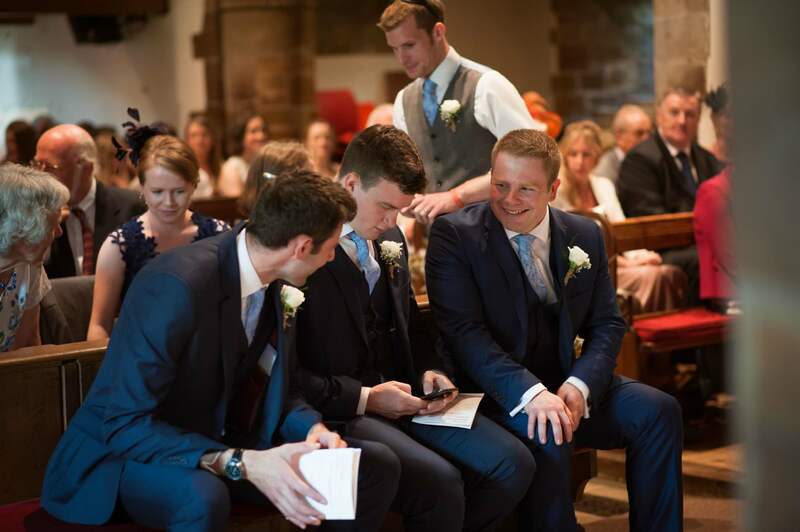 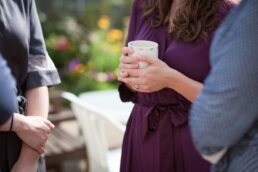 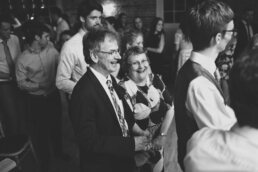 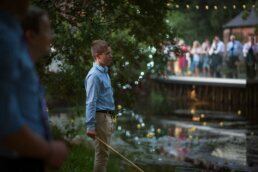 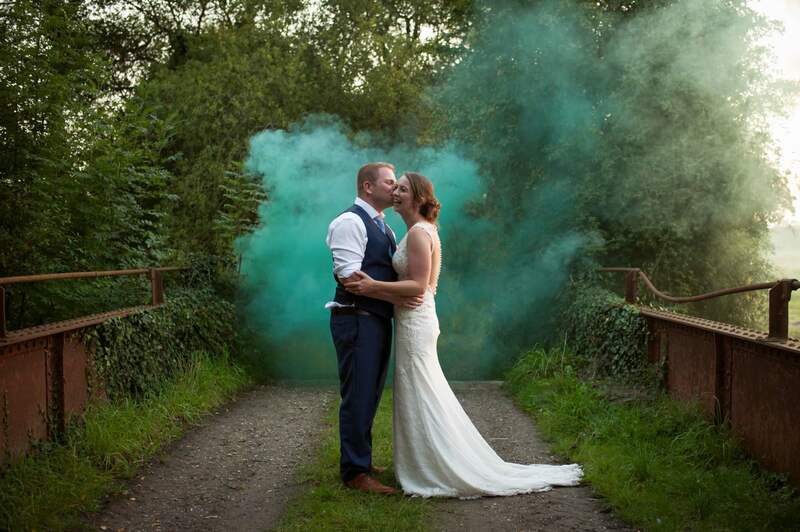 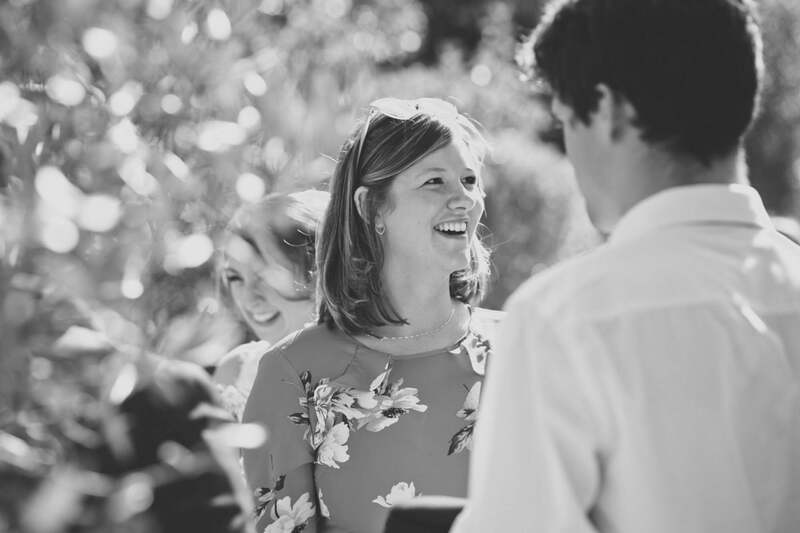 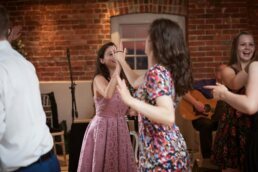 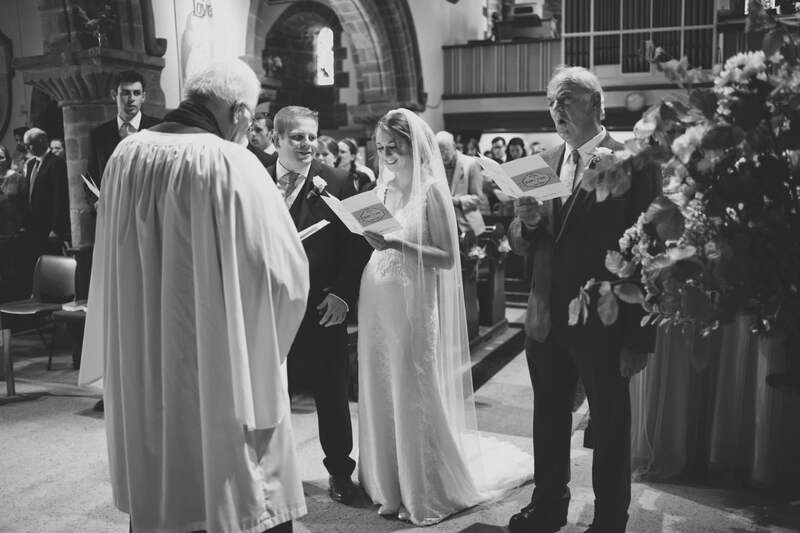 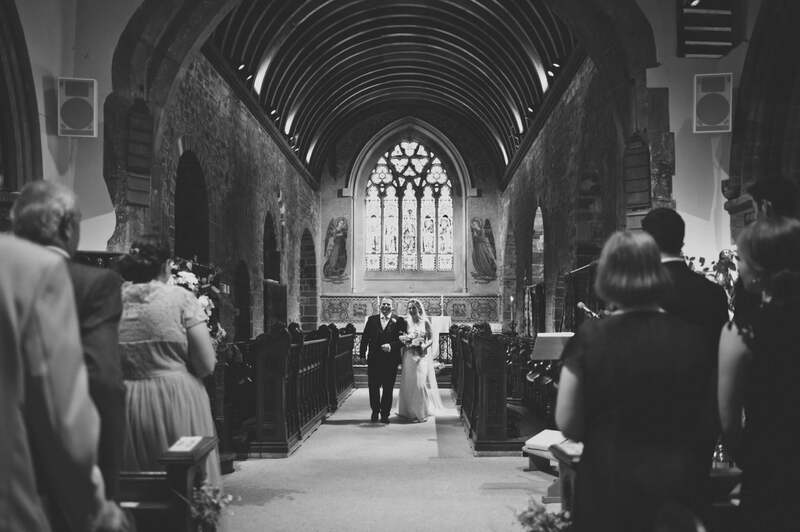 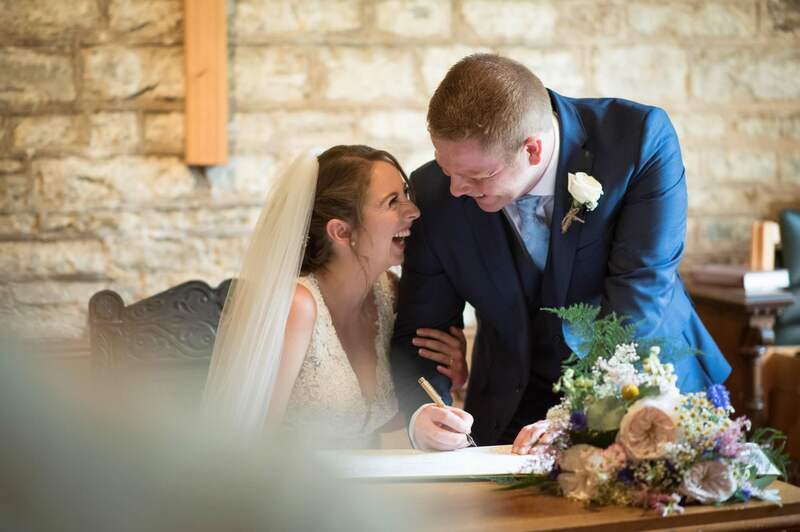 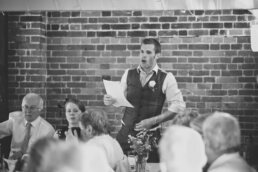 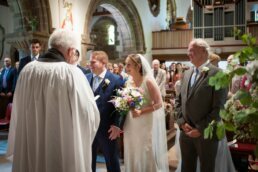 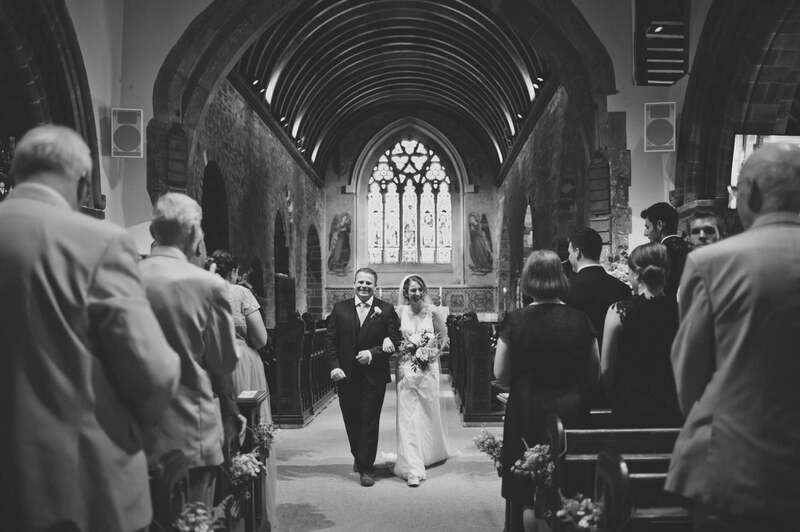 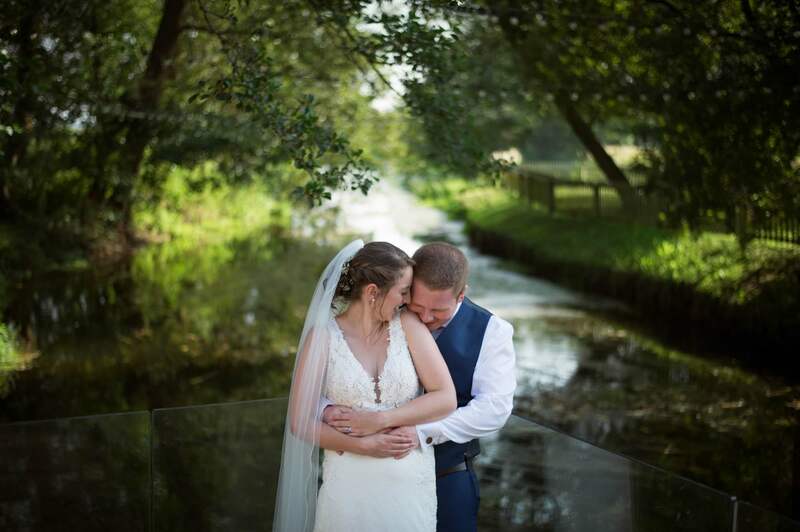 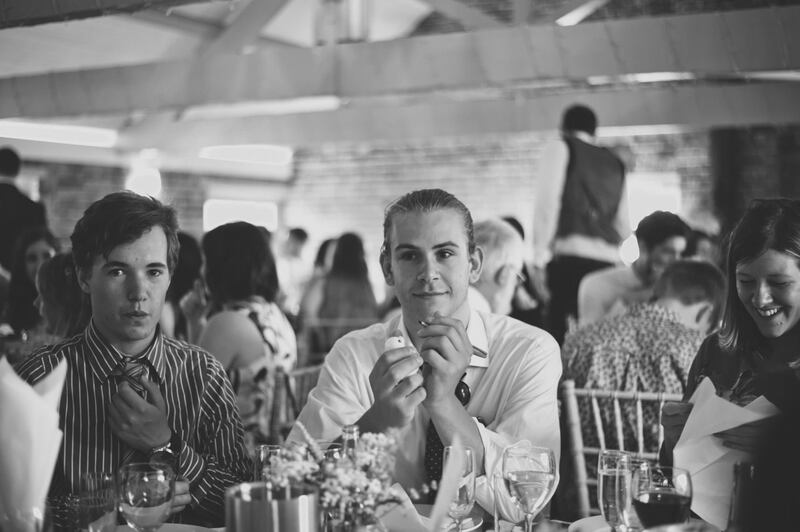 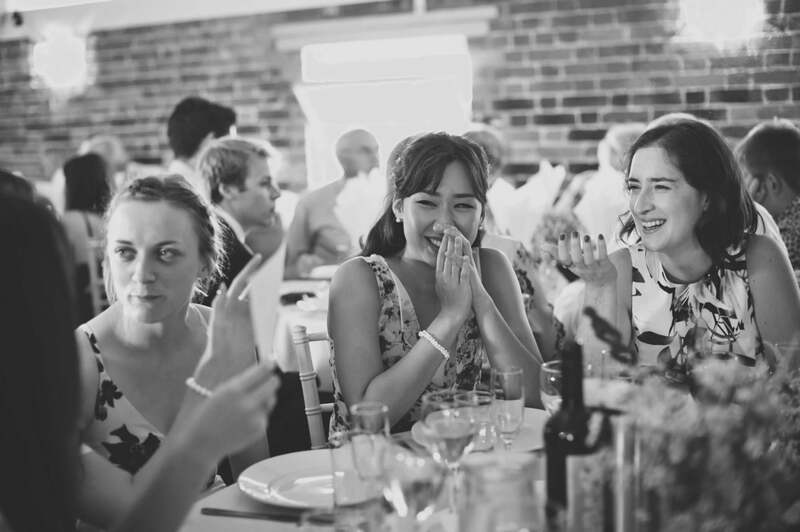 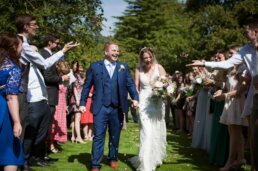 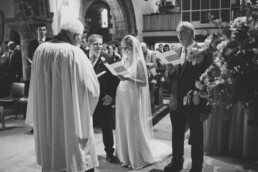 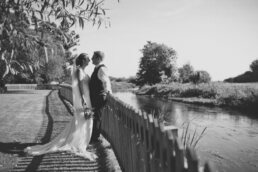 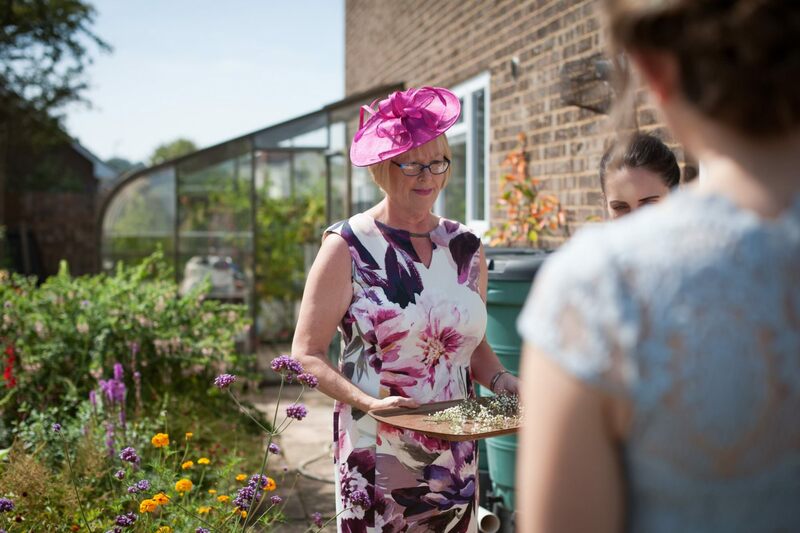 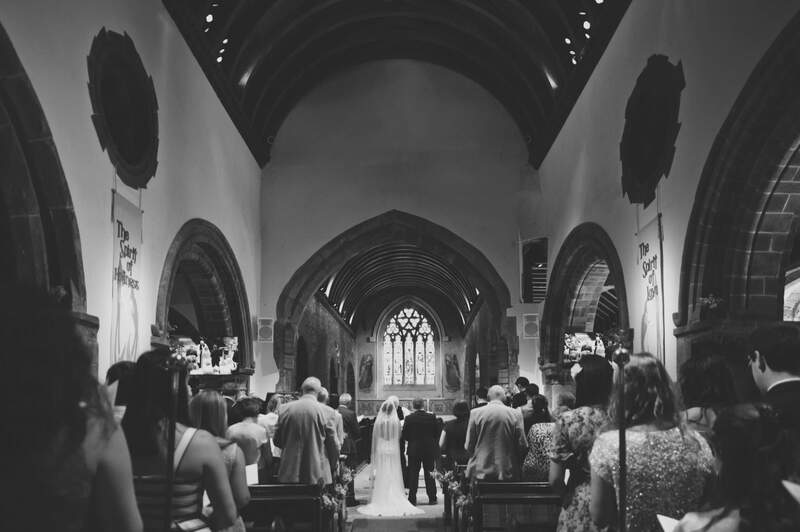 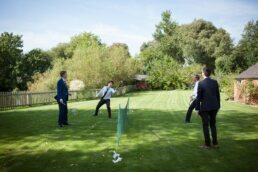 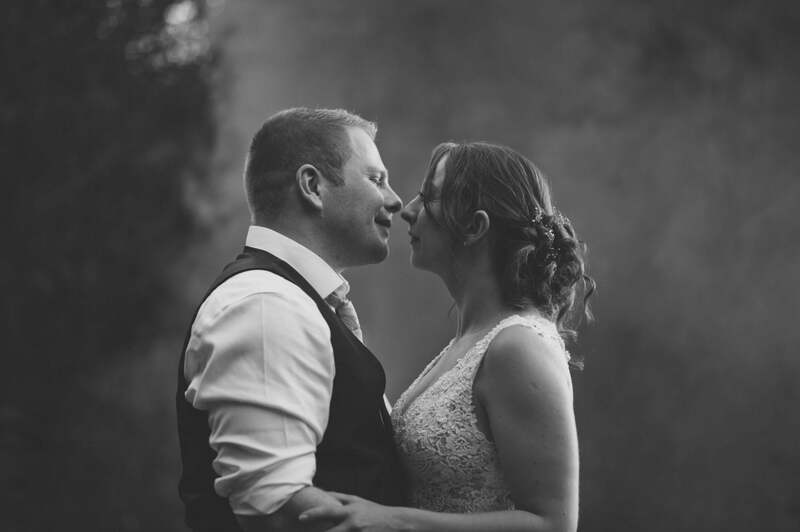 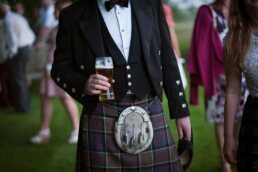 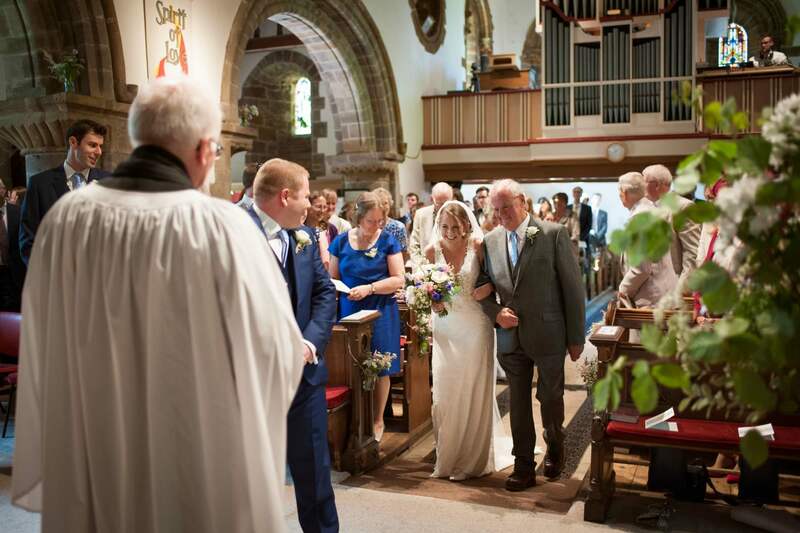 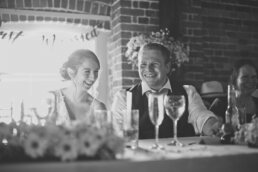 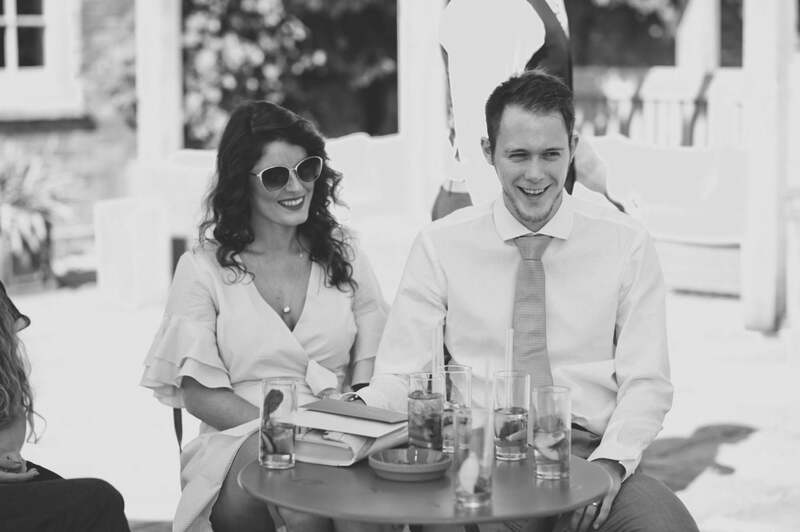 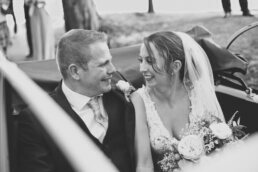 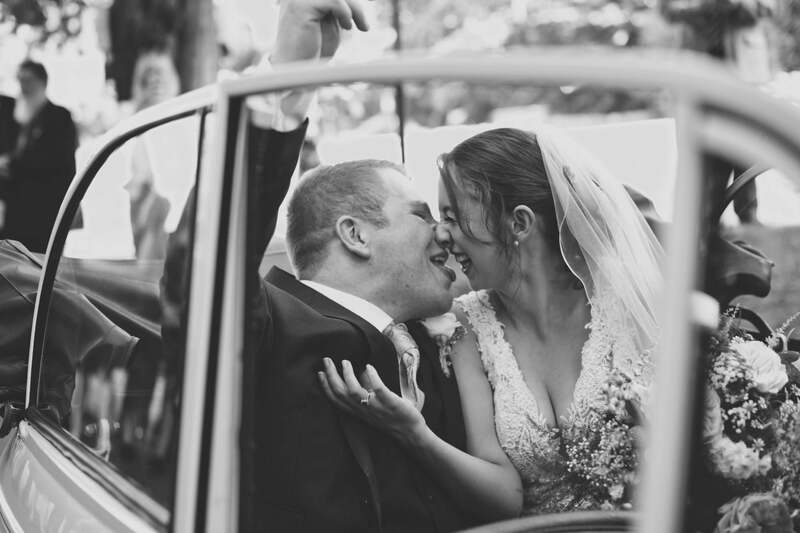 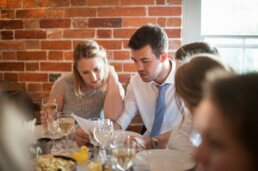 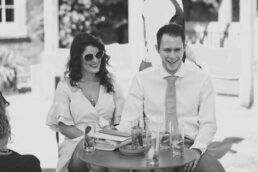 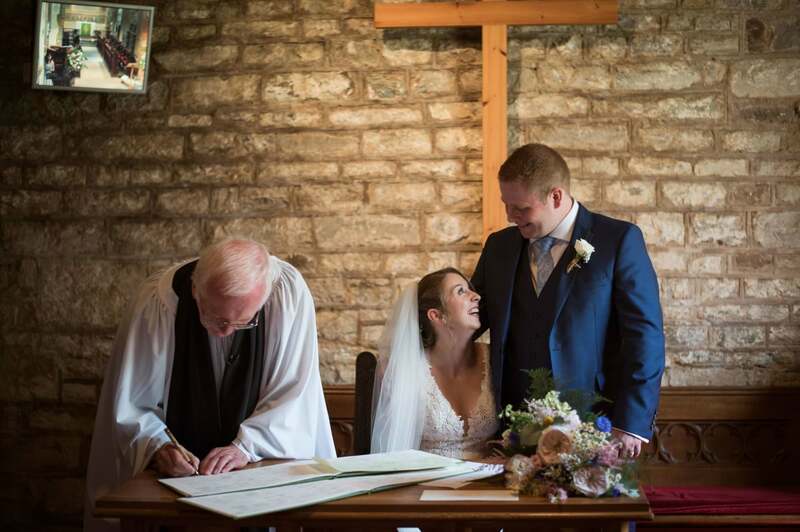 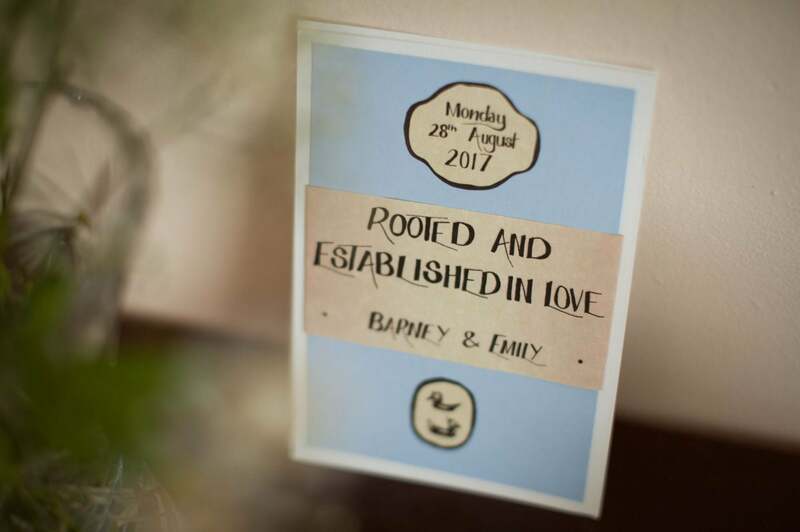 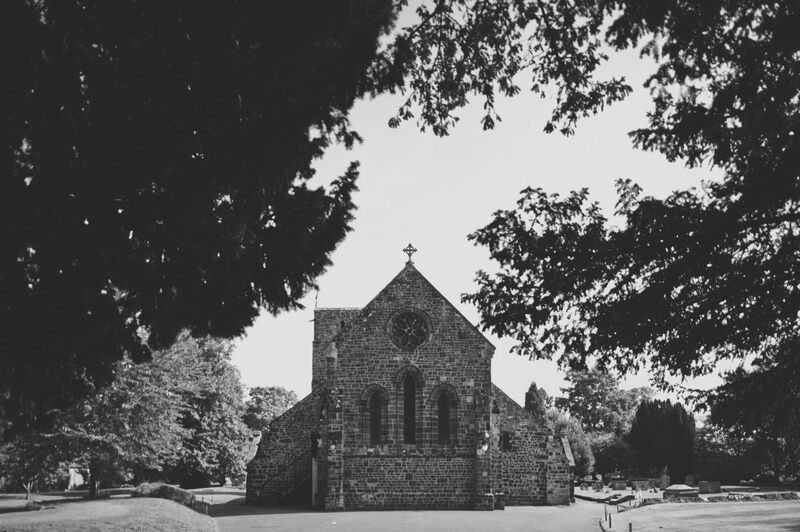 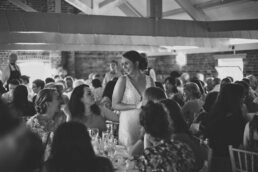 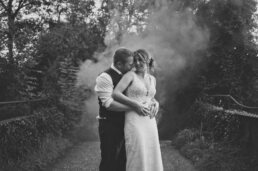 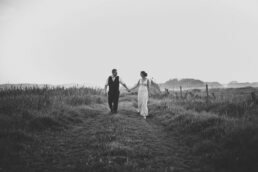 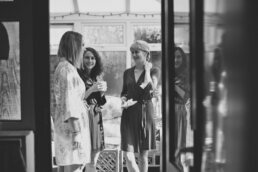 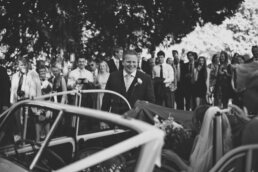 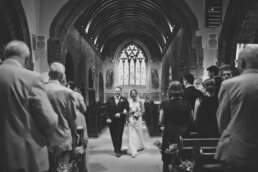 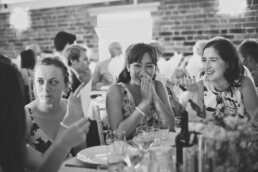 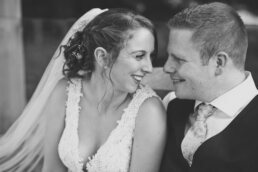 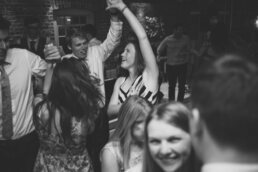 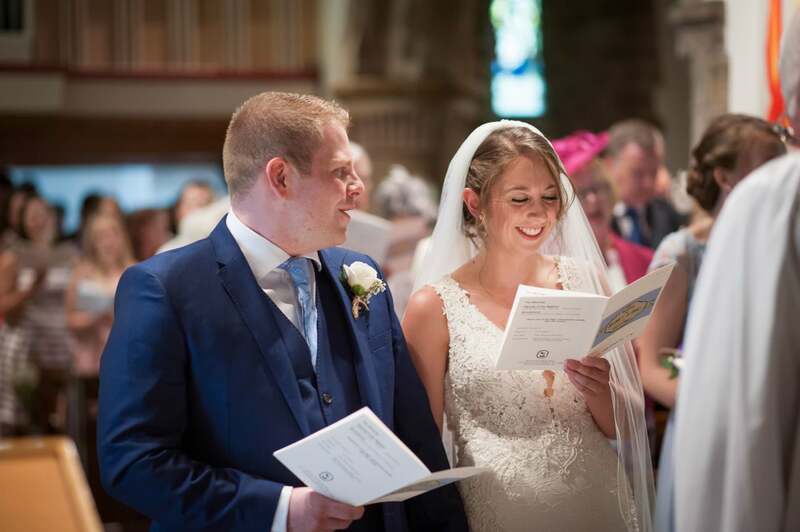 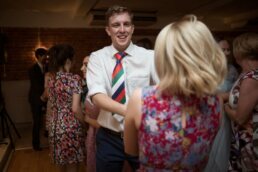 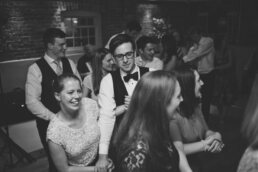 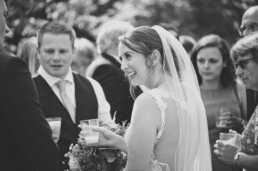 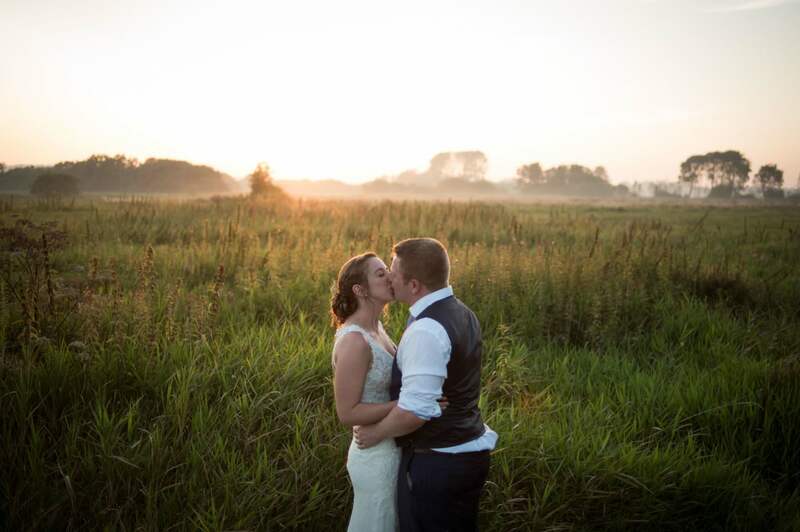 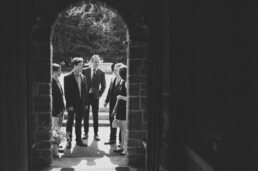 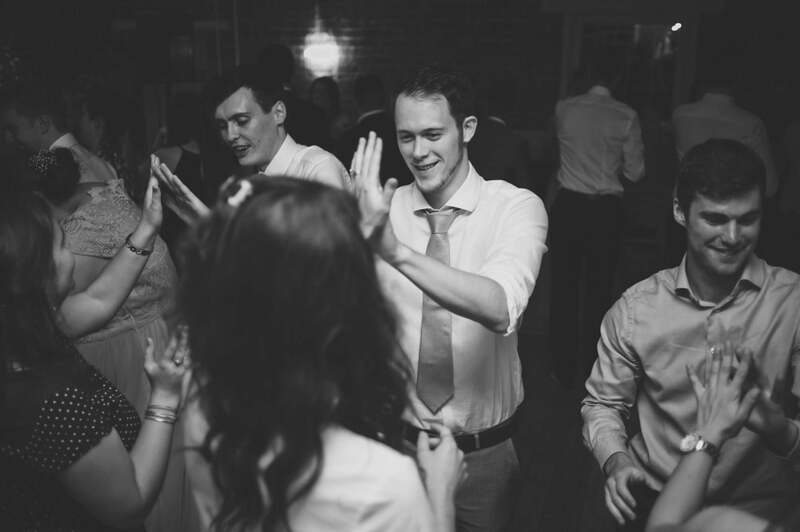 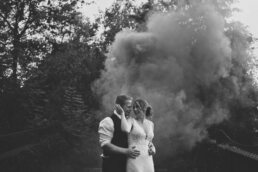 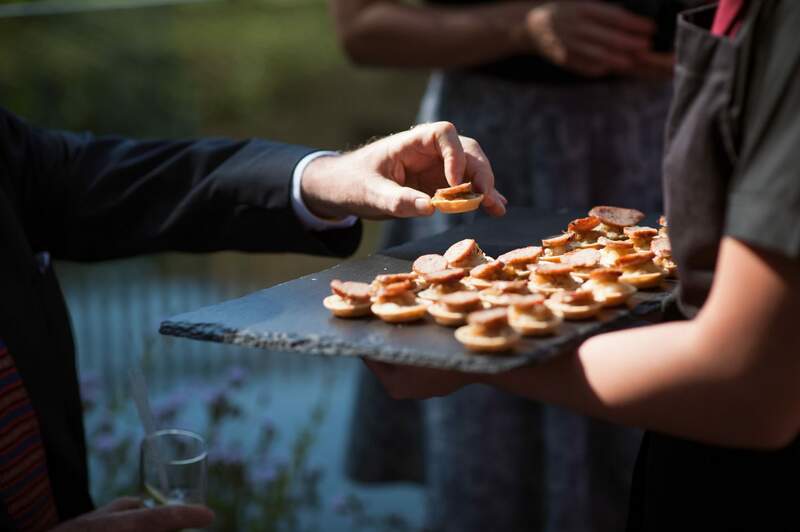 Back in 2017, in the middle of a wash out August, a break in the clouds saw a scorching bank holiday weekend and the idyllic wedding of Emily and Barney. 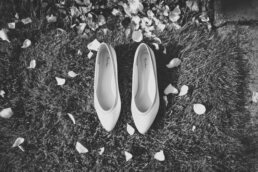 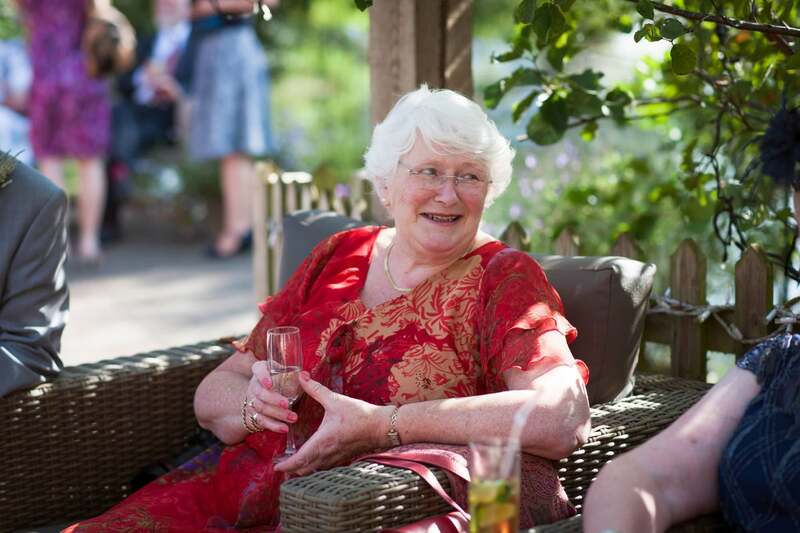 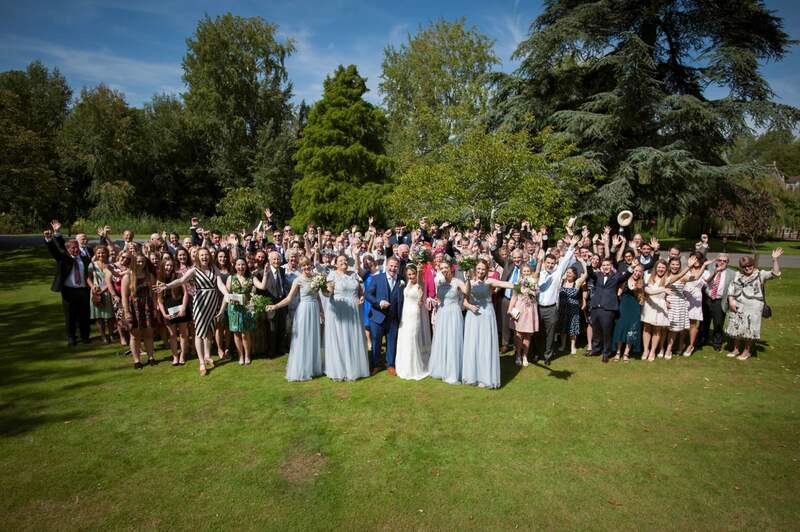 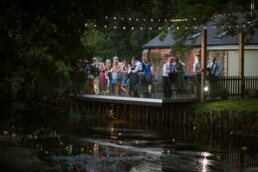 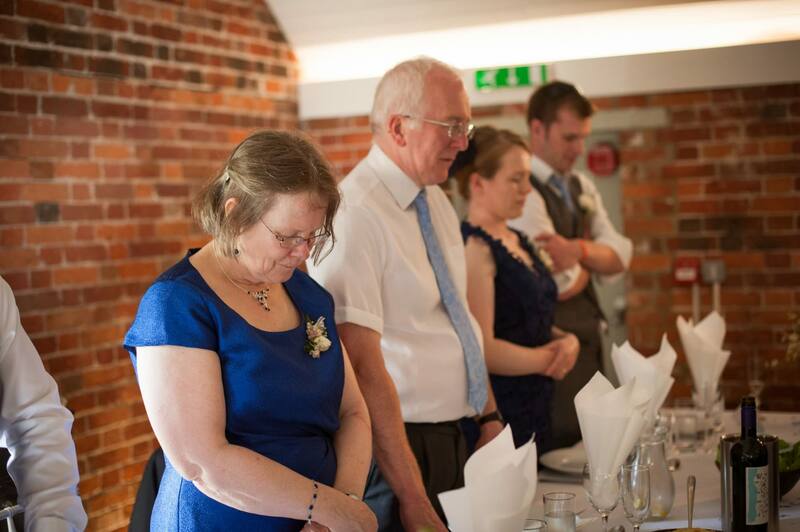 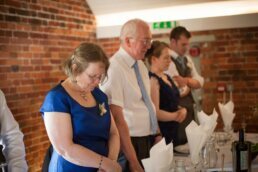 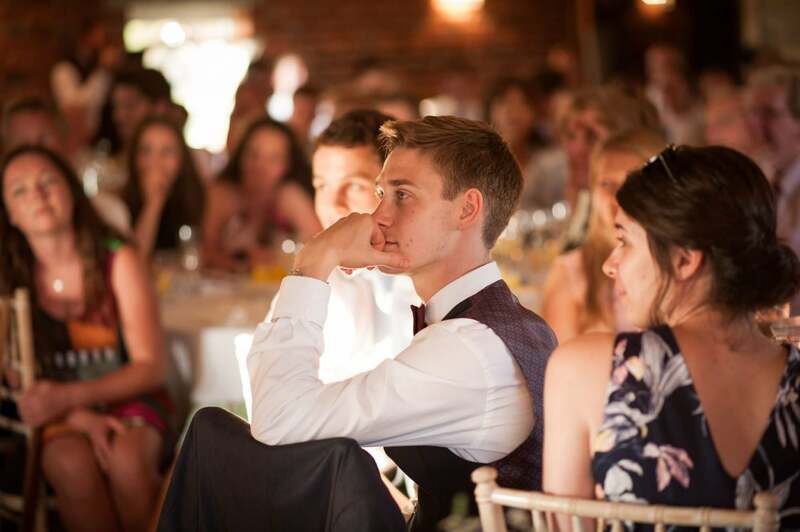 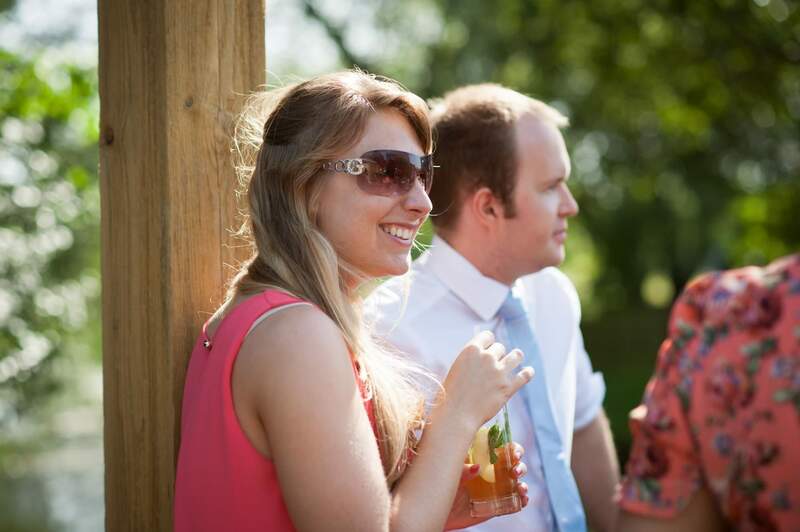 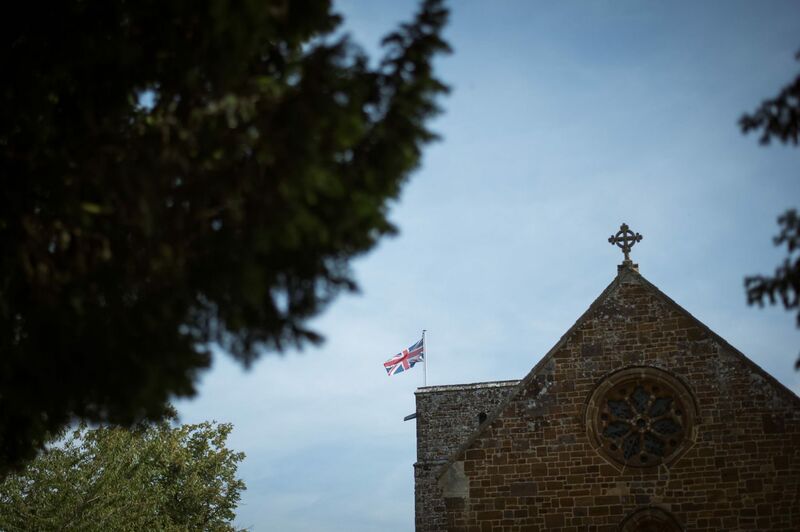 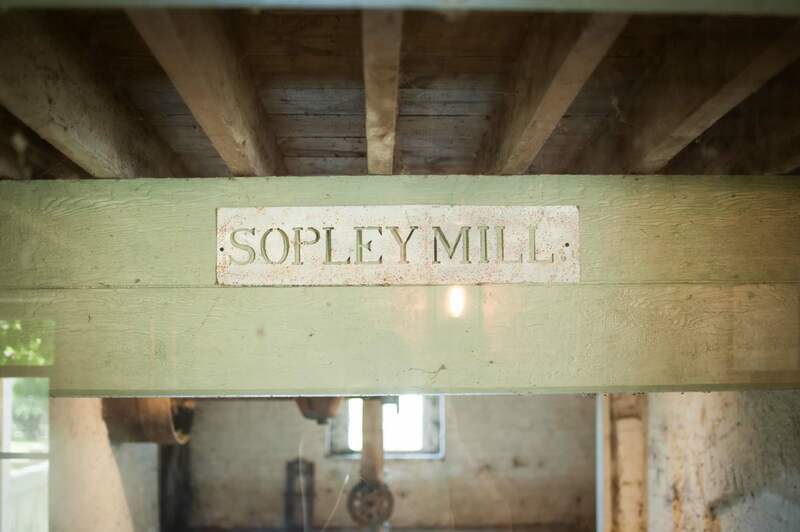 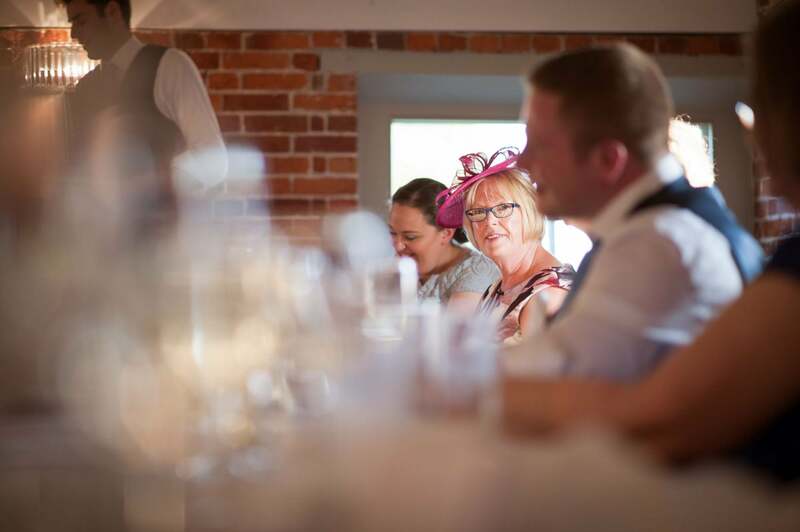 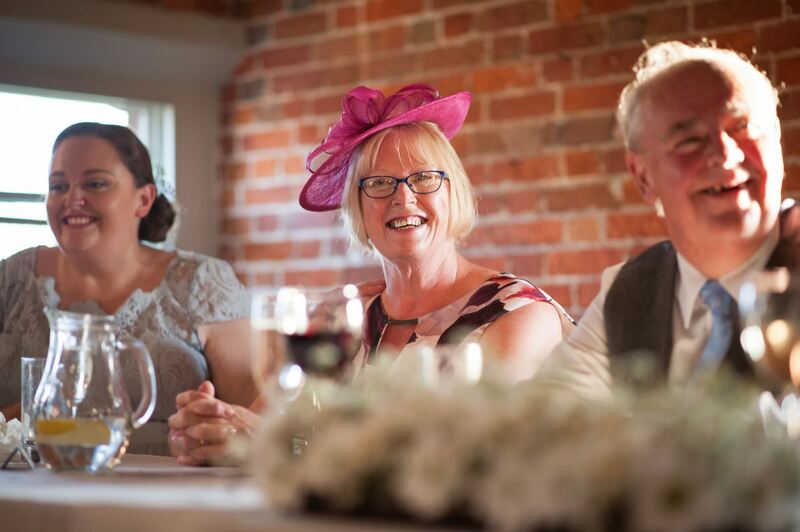 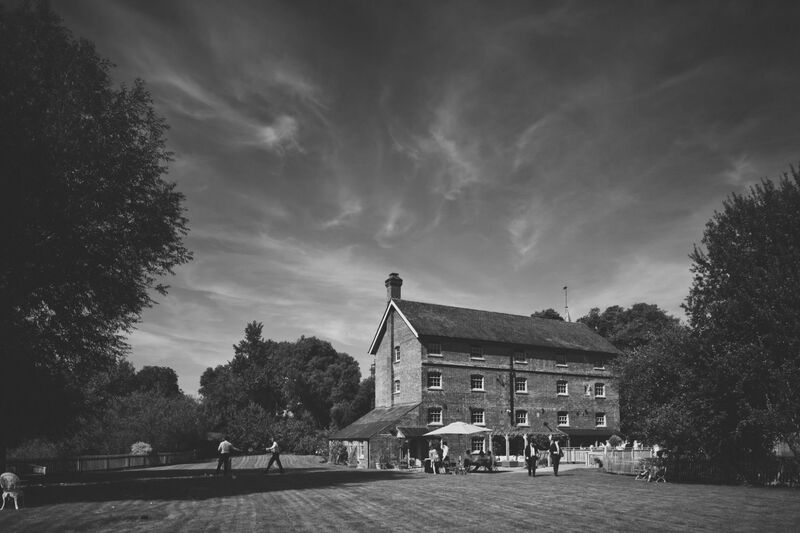 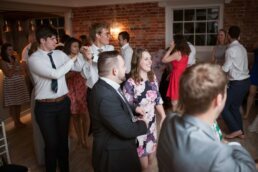 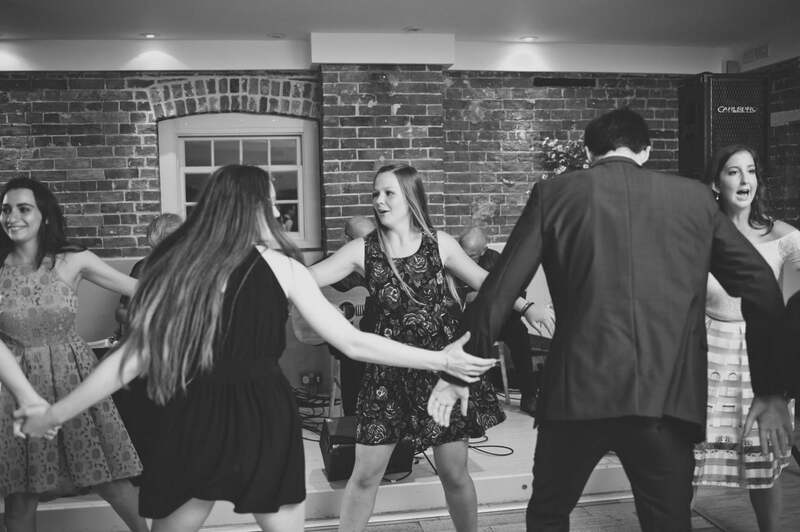 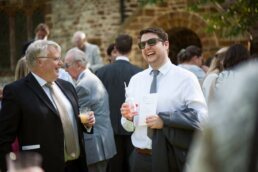 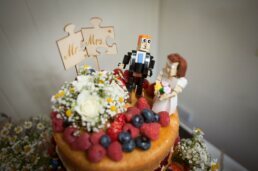 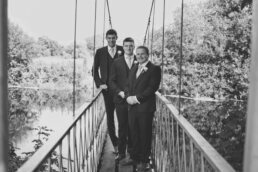 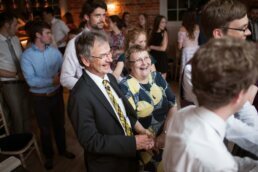 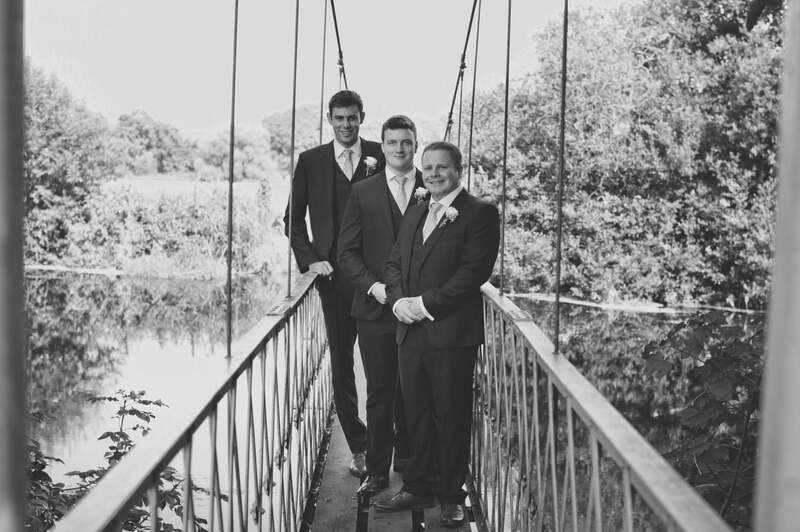 A Canford Magna Church wedding followed by the reception at Sopley Mill. 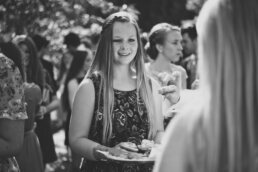 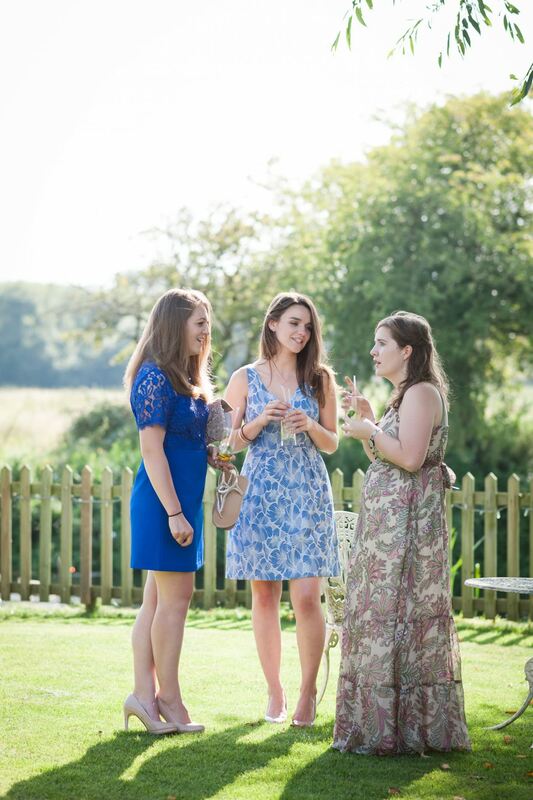 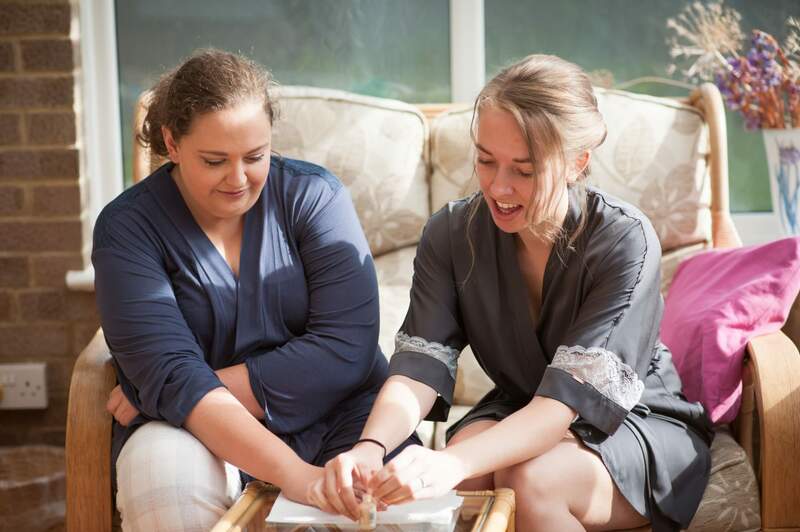 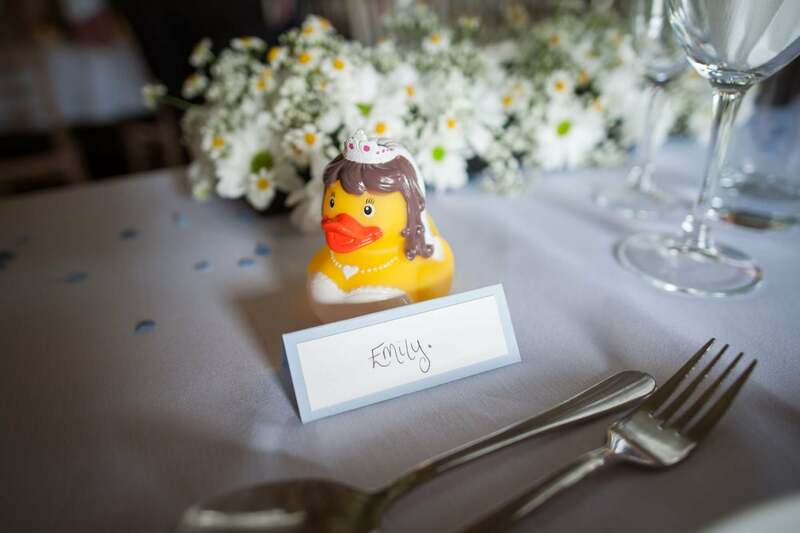 The day was full of charm and went ‘swimmingly’ – Emily was ready to ‘fly the nest’. 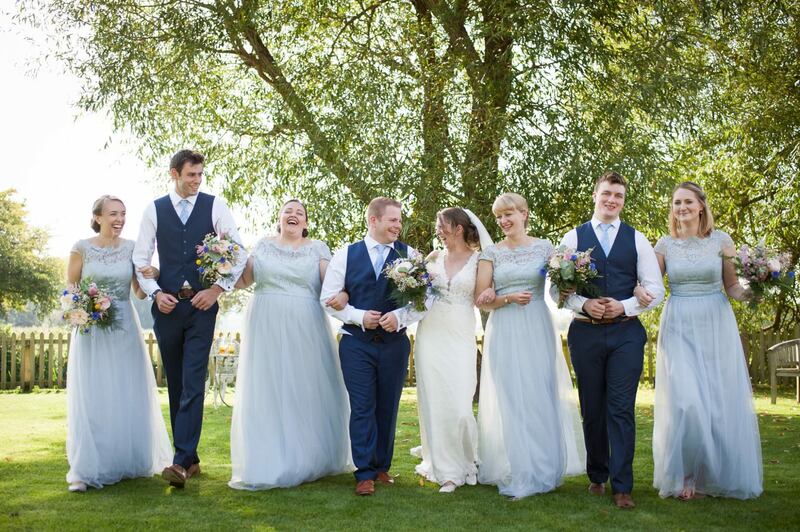 Can anyone spot a theme here?! Bridal prep took place at the Emily’s parents house, a stone’s throw away from the church where they would tie the knot in a few hours time. 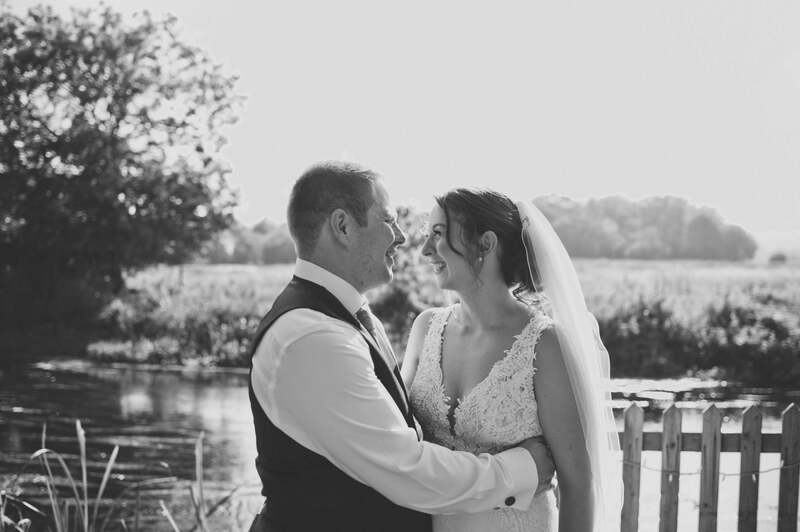 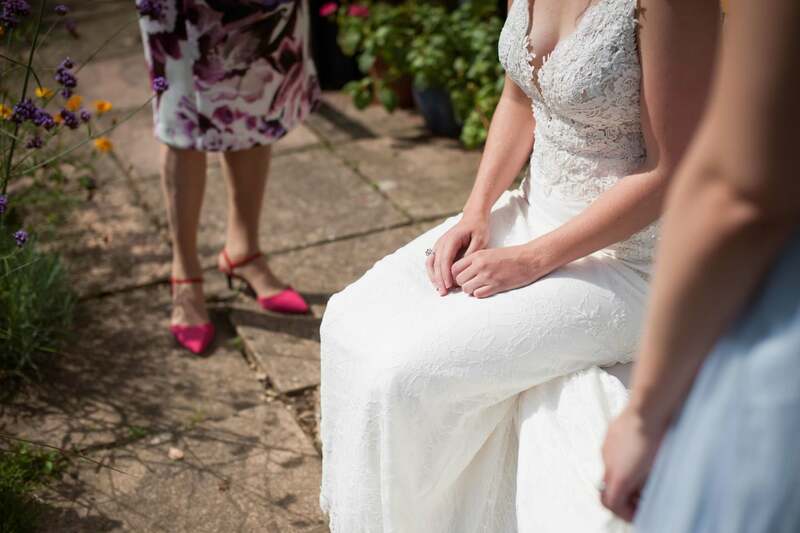 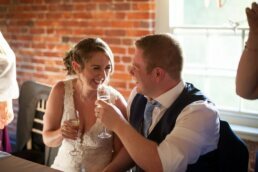 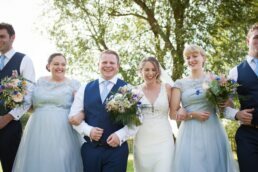 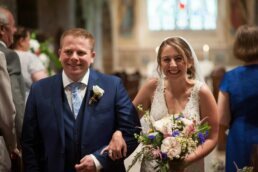 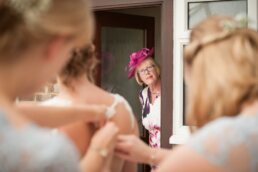 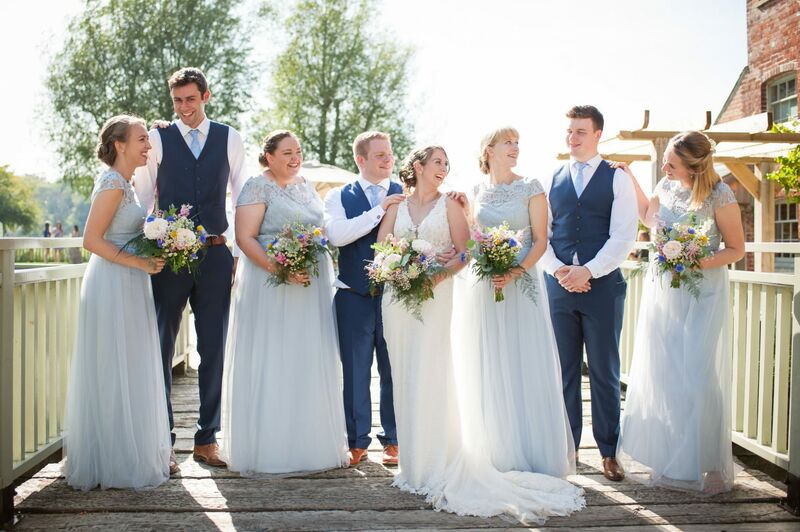 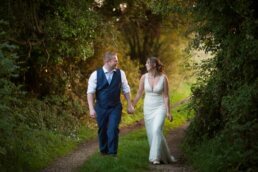 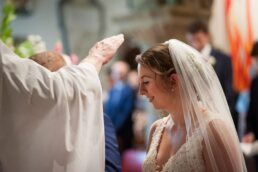 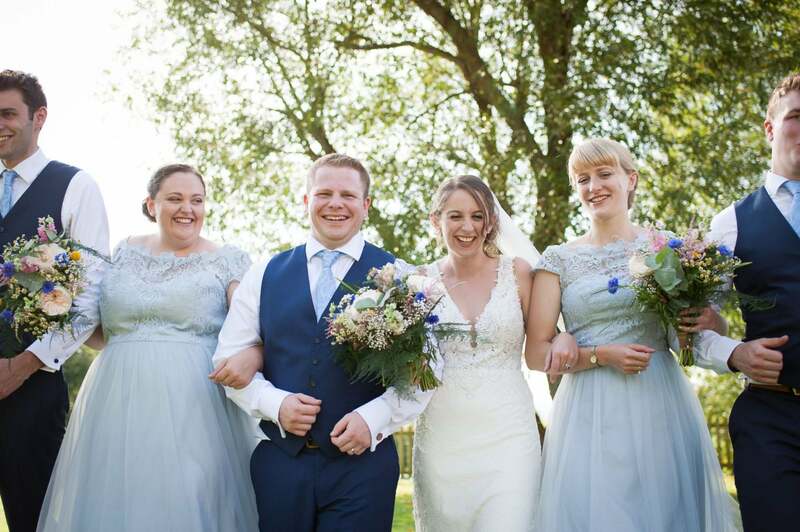 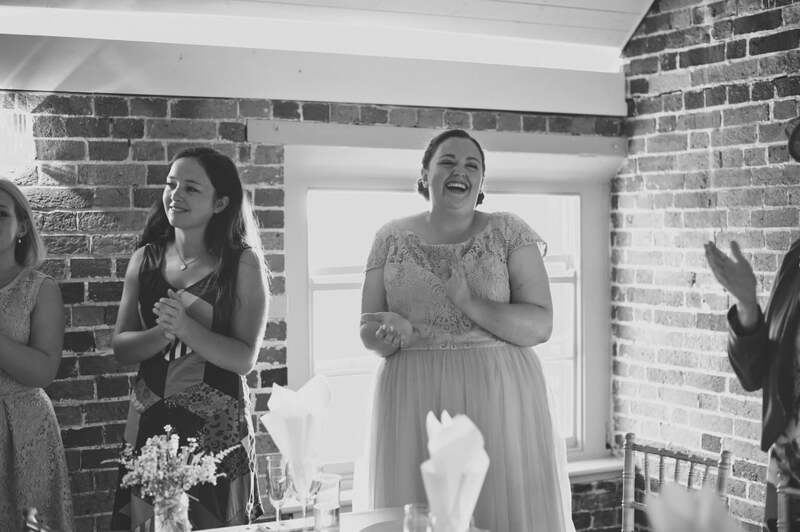 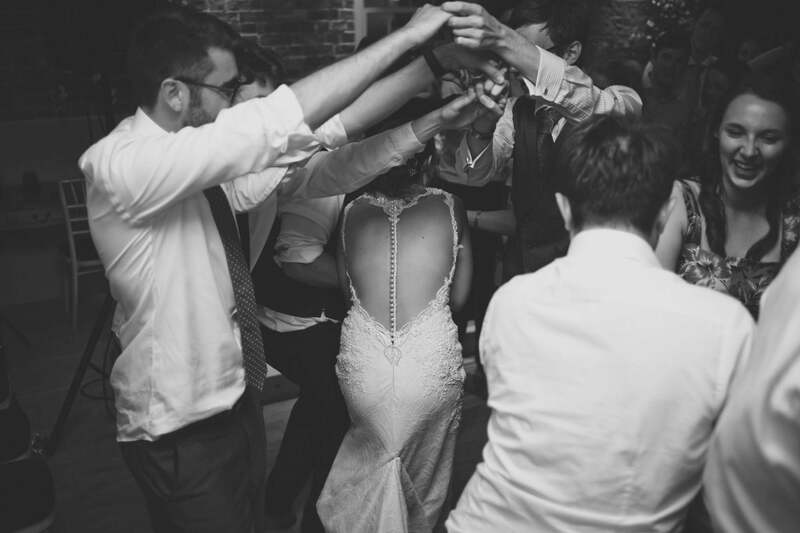 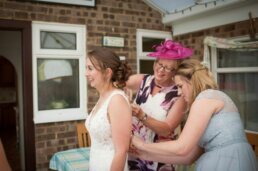 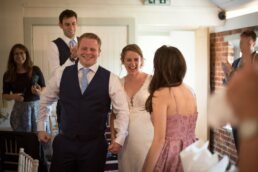 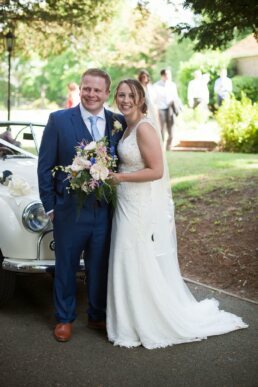 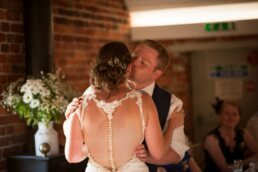 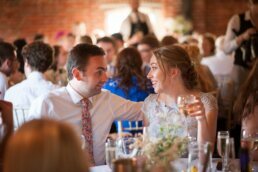 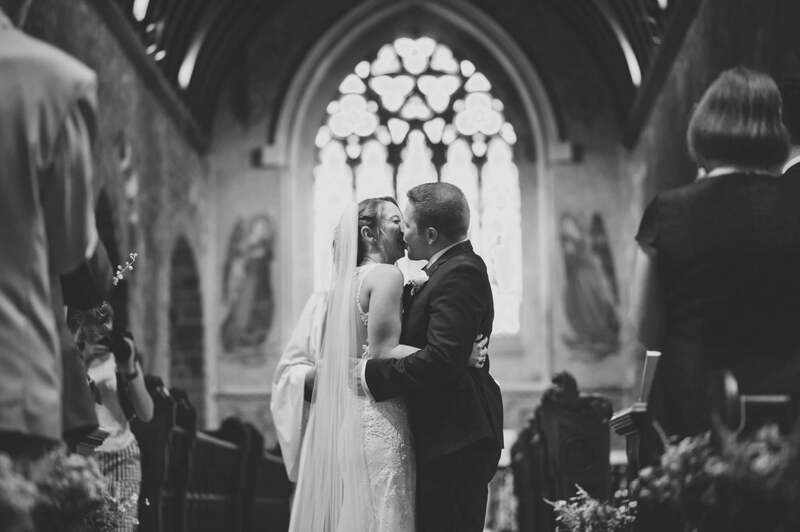 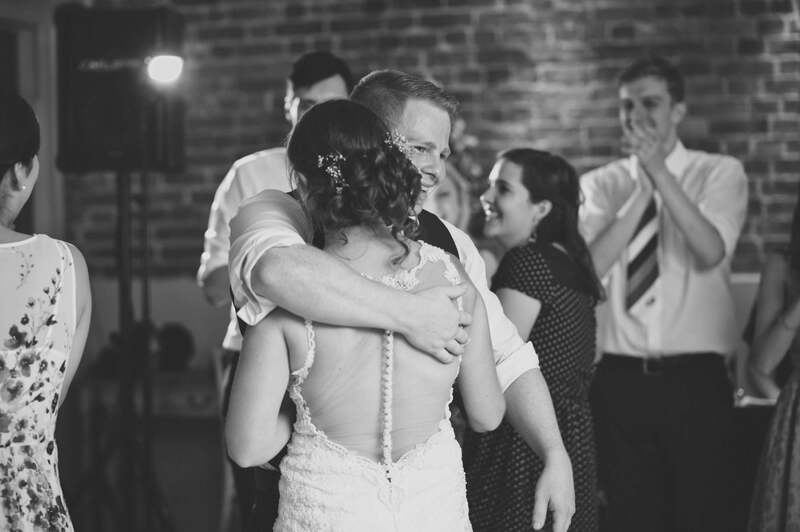 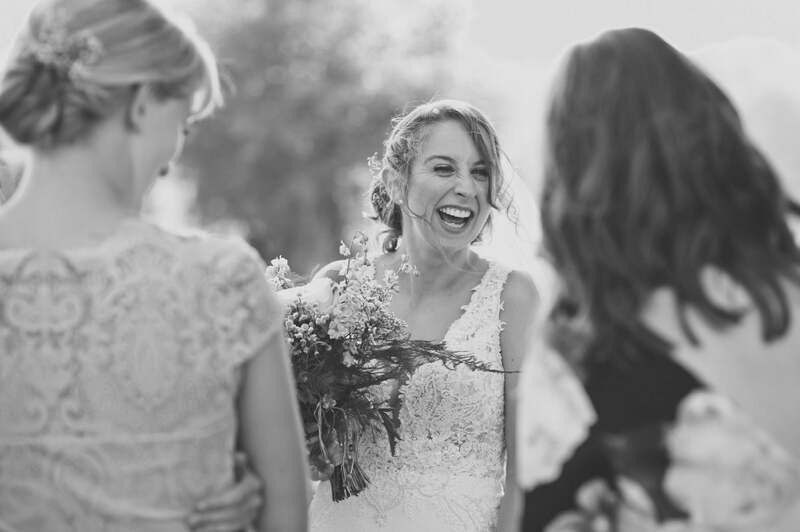 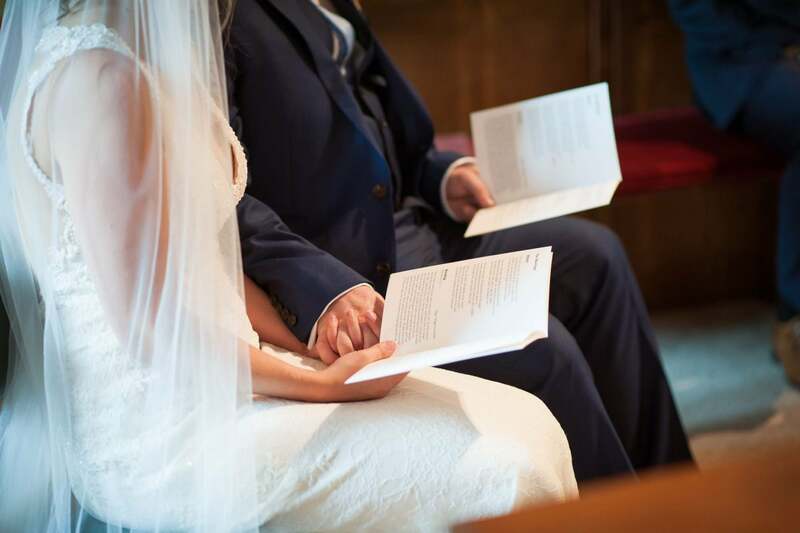 Emily’s dress was a slinky Martina Liana gown with delicate beading on the bodice and an open back with button detail, from Minster Designs in Wimborne. 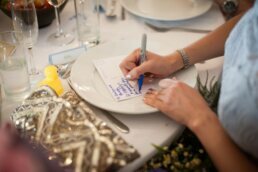 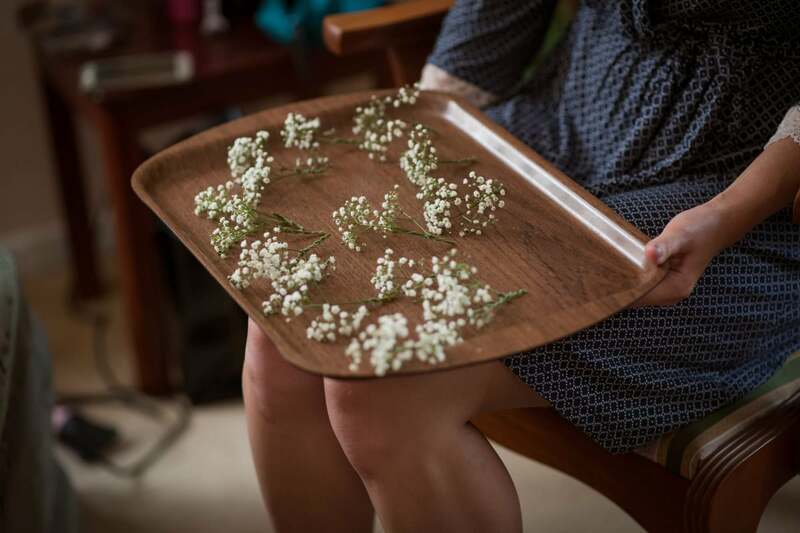 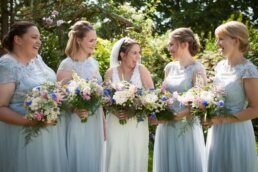 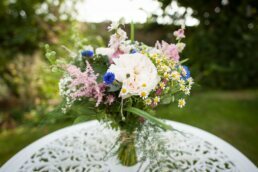 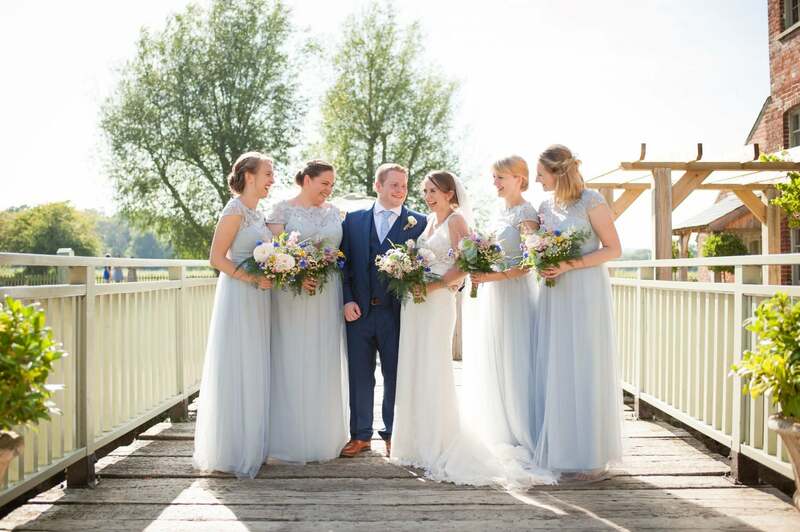 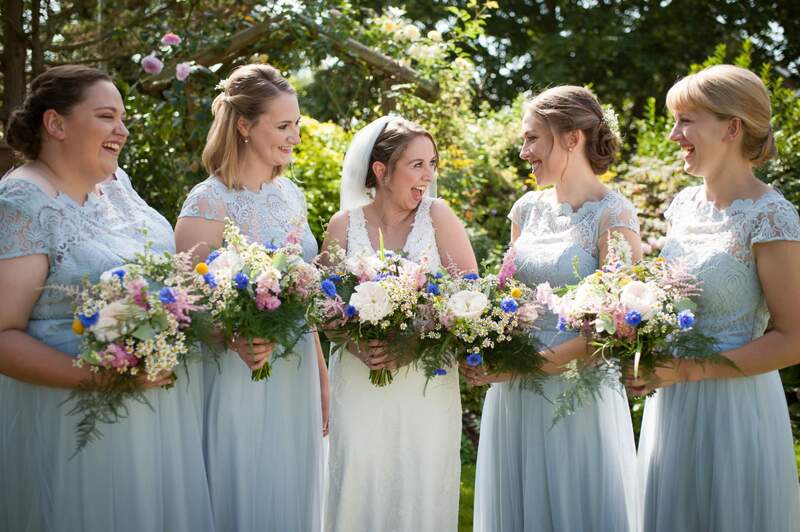 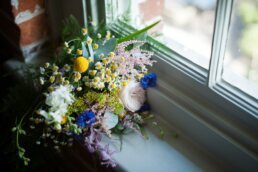 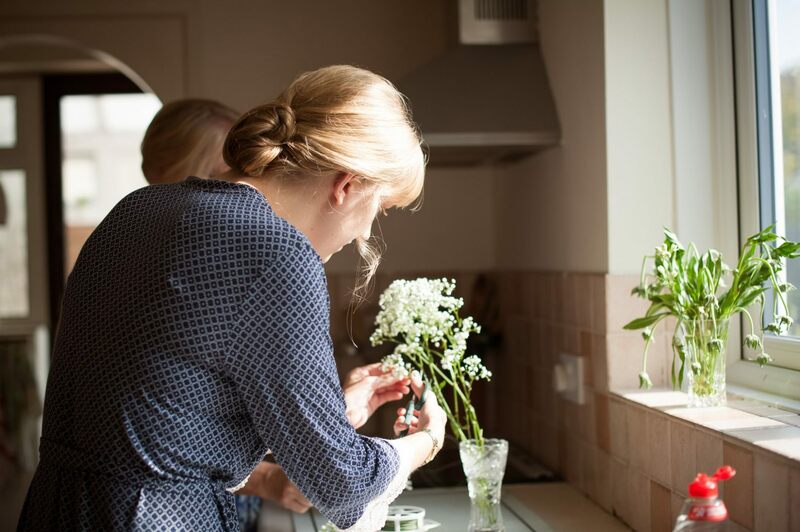 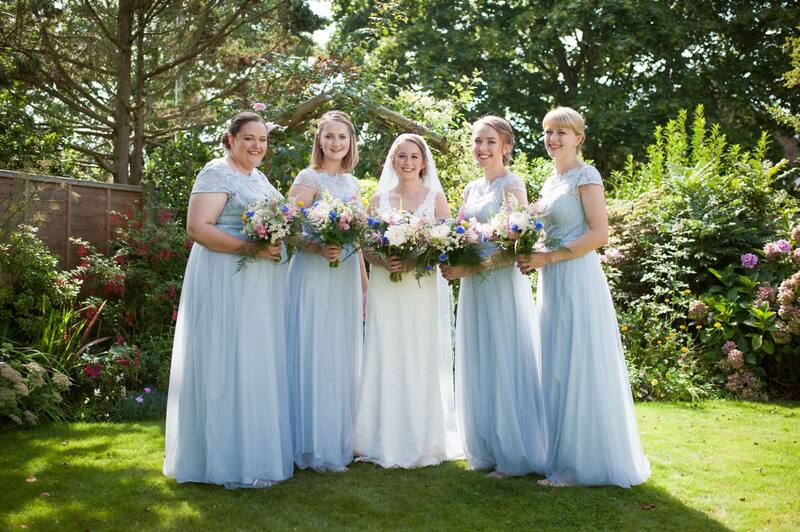 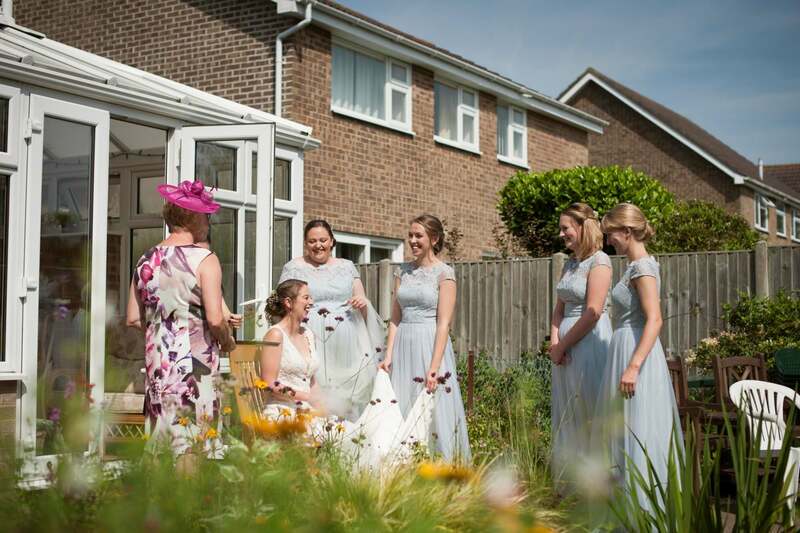 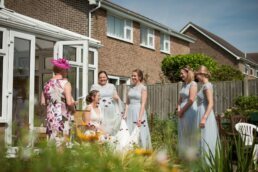 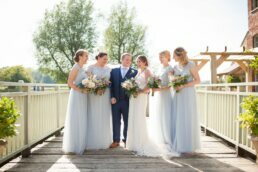 Bridesmaids wore soft powder blue Chi Chi London gowns, complimented by undone whimsical flowers. 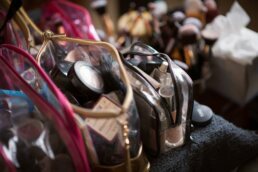 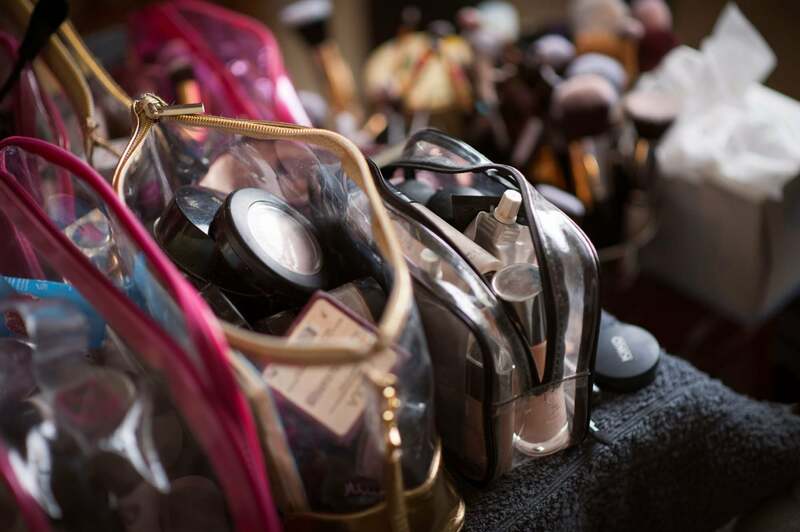 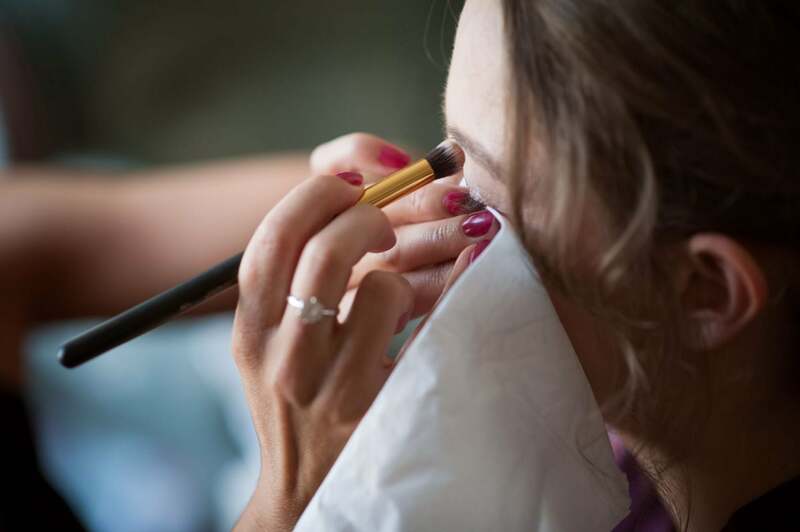 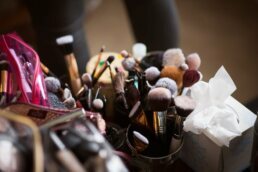 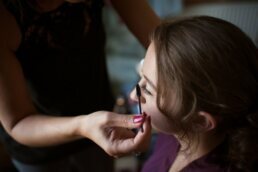 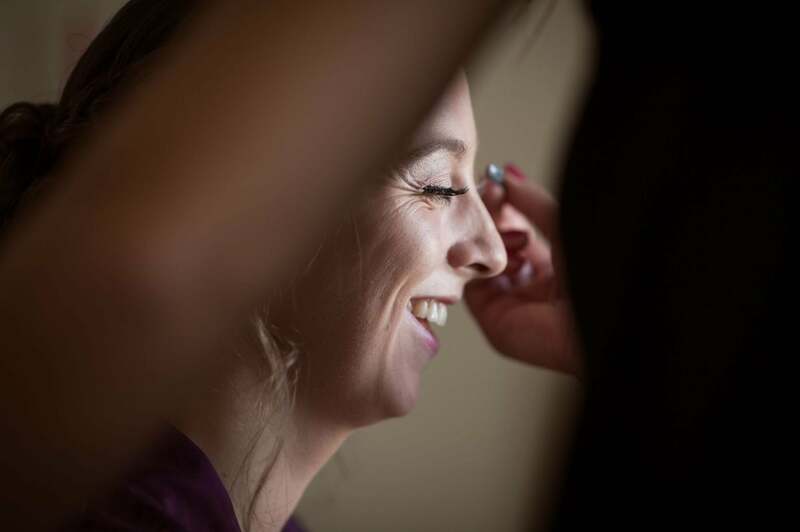 Barnet & Boatrace set up space in a nice cool room to do hair & make-up for the bride tribe. 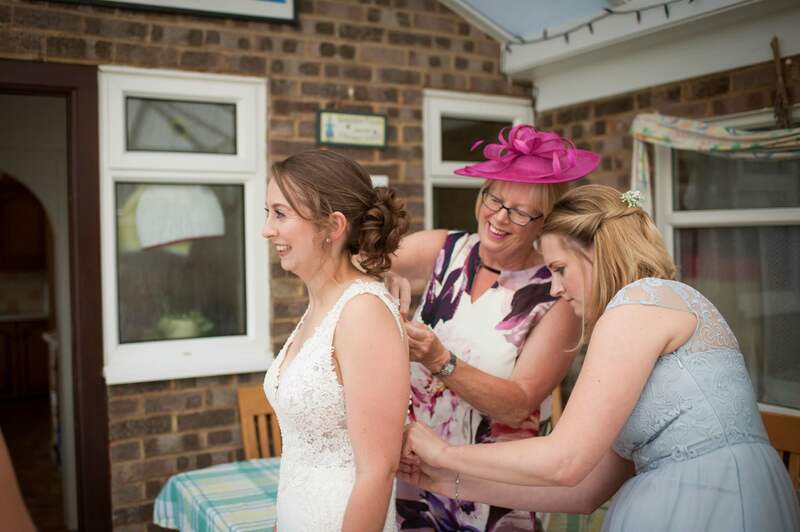 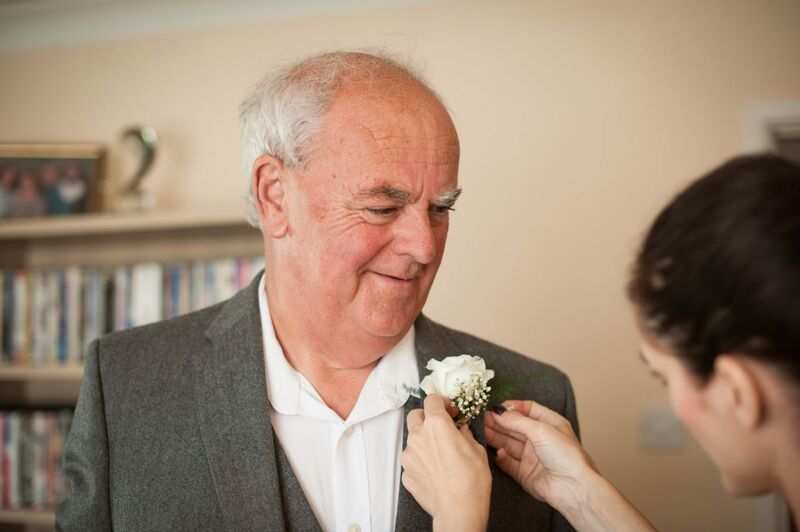 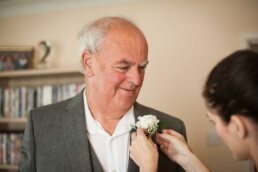 A sense of calm and excitement, whilst Emily’s mum helped make some floral hair pieces and Emily’s dad poured the bubbly. There were even a few tears when the flowers arrived and suddenly it all felt real! 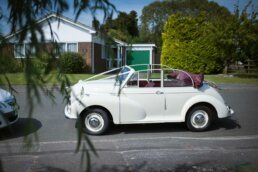 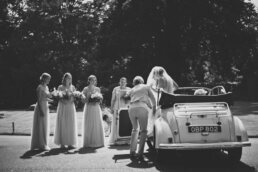 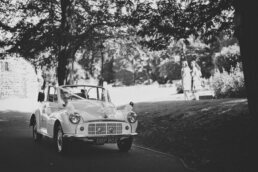 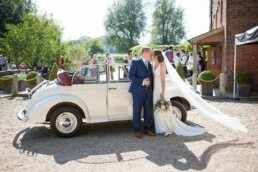 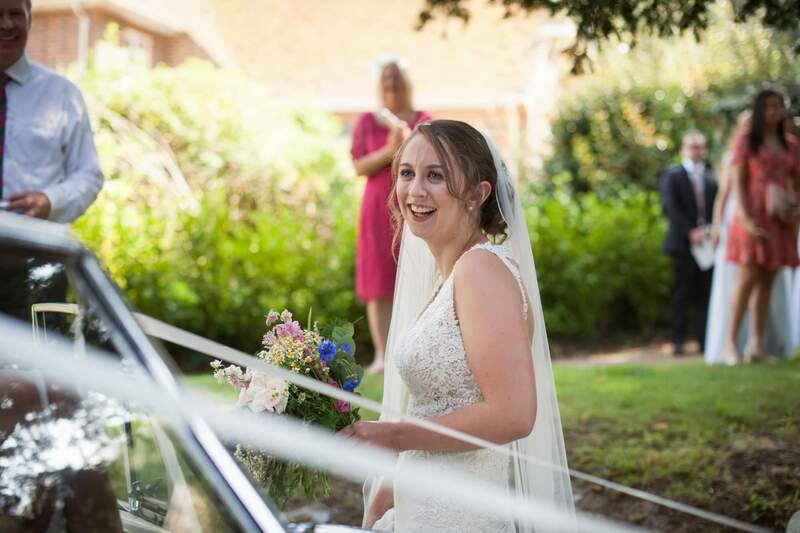 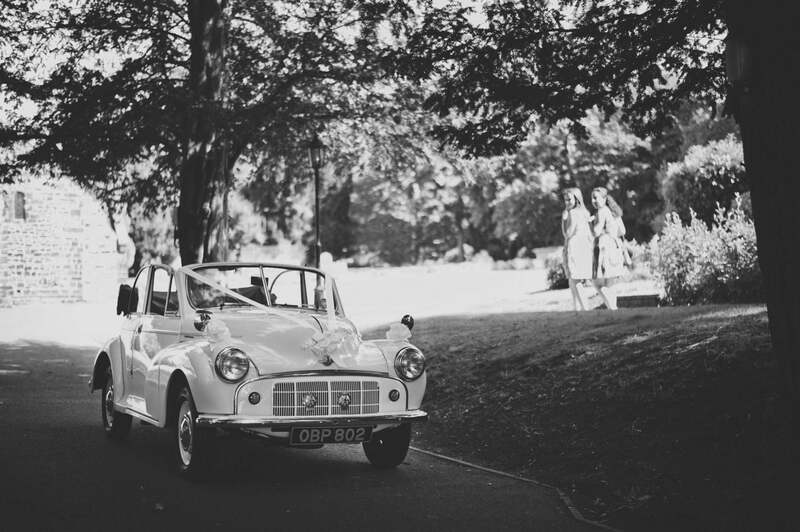 After posing for a few photos in Emily’s parents gorgeous garden, Emily hopped in a Morris Minor convertible which was perfect for the short and sunny journey to their Canford Magna Church wedding. 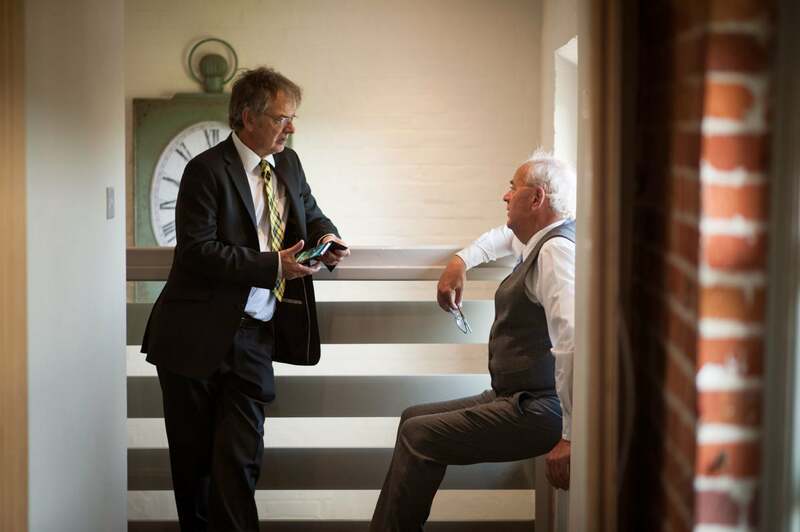 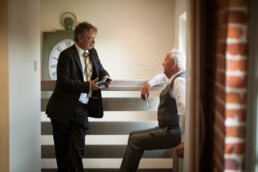 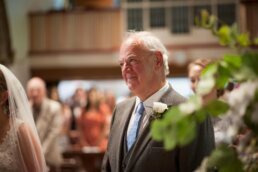 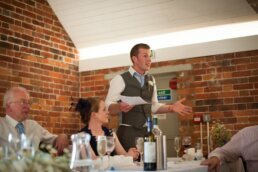 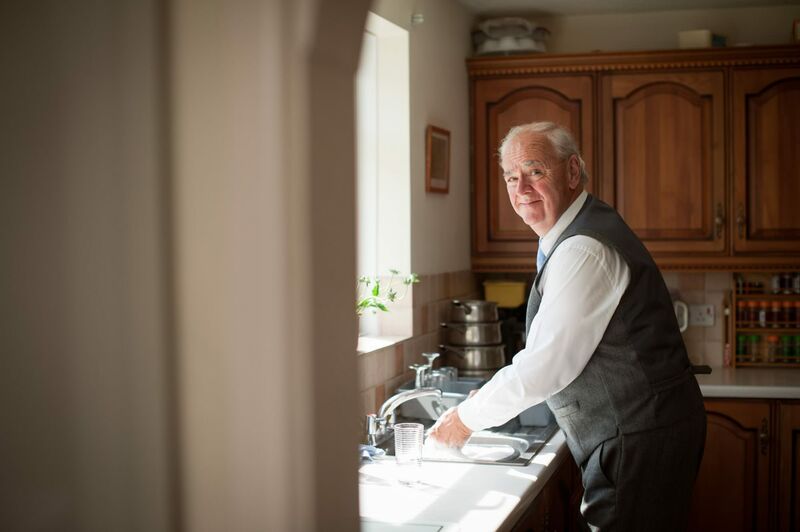 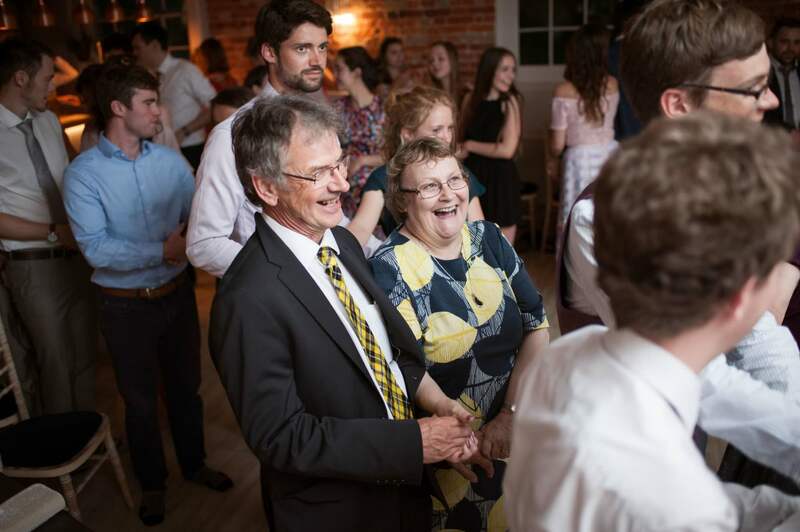 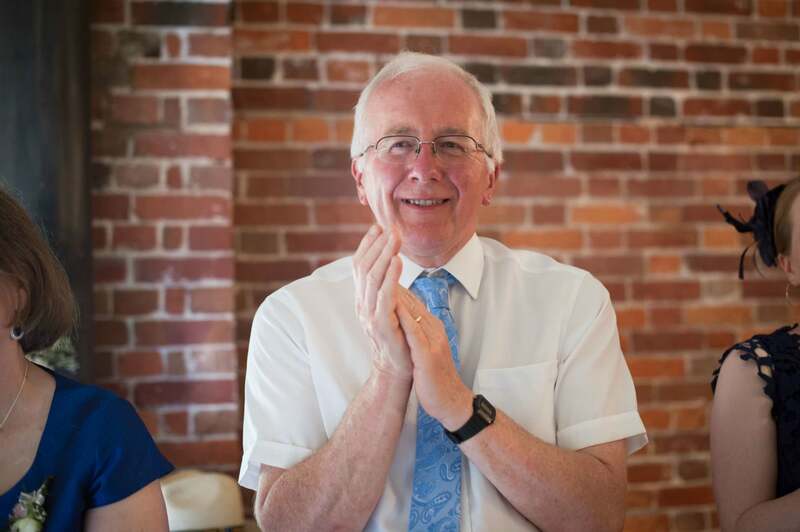 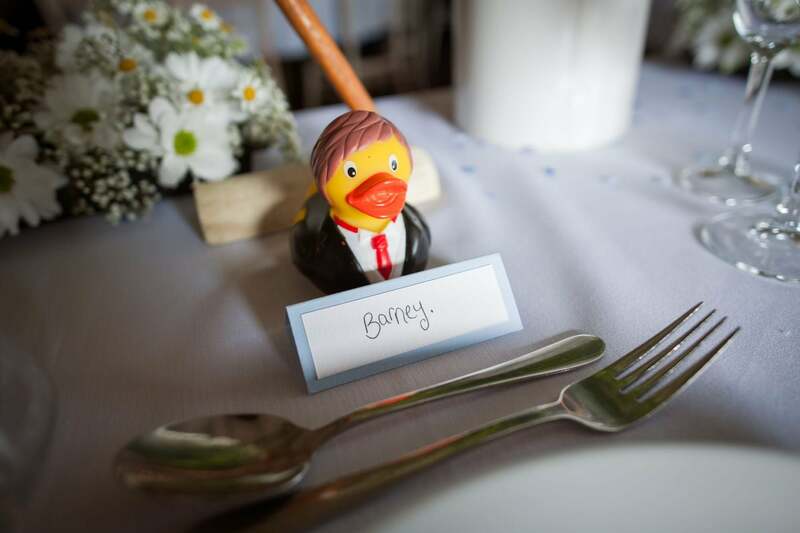 The whole wedding ceremony was conducted by Barney’s father, which was very personal and funny too! 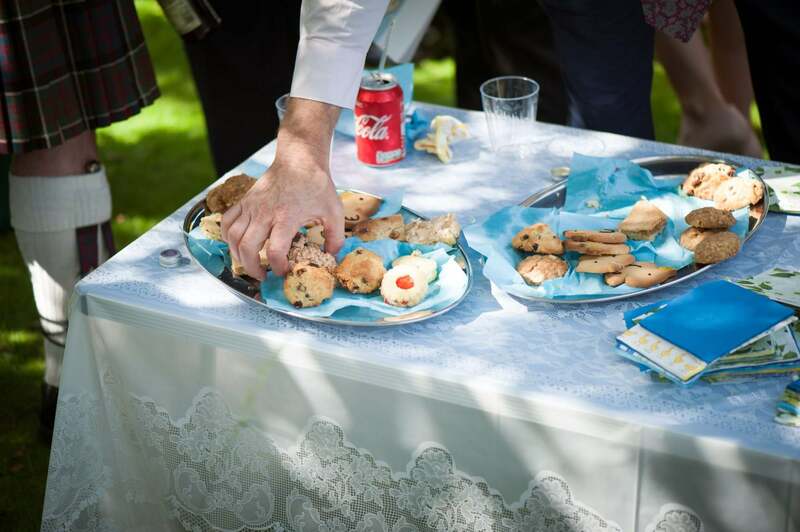 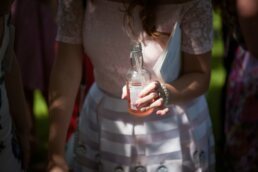 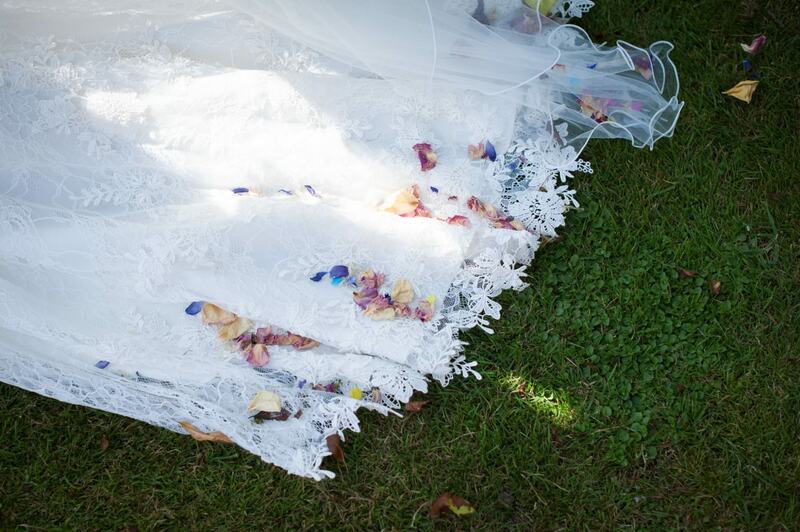 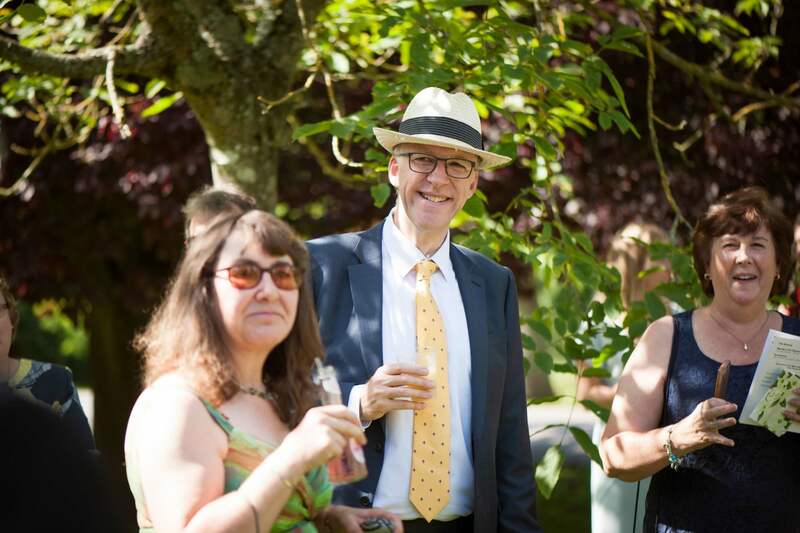 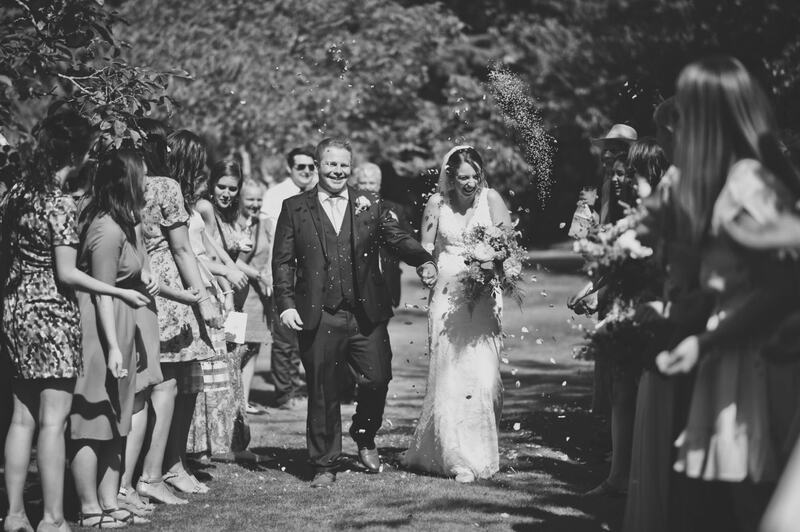 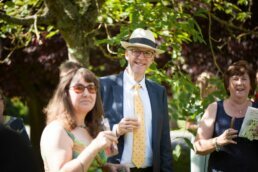 Everyone enjoyed drinks and homemade biscuits in the church gardens followed by a confetti tunnel as the newly weds left to head off to Sopley Mill. 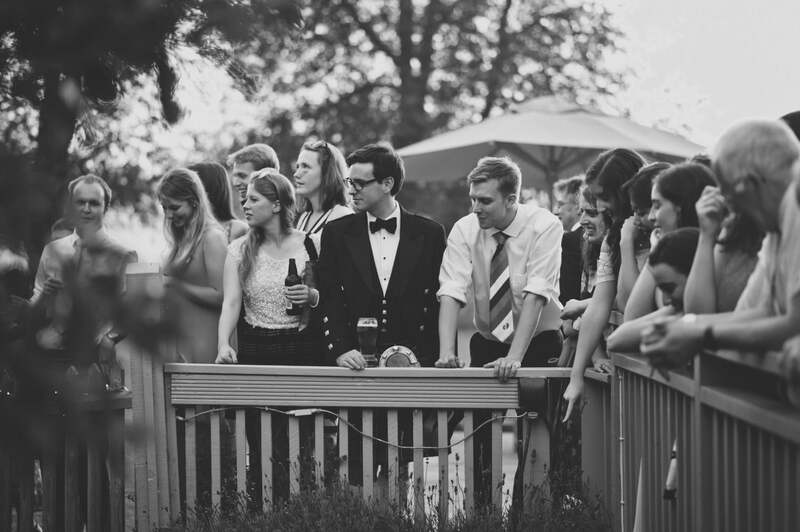 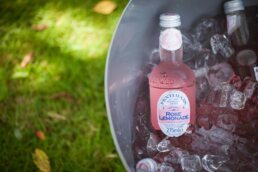 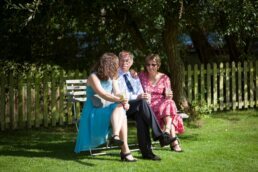 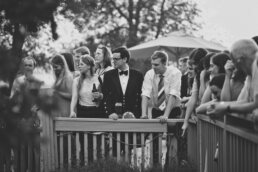 A champagne reception allowed the perfect opportunity for a quiet moment with the couple to take photographs in the sun before moving to a cooler, shady area. Each guest was gifted their own rubber duck to decorate during the meal with their own personal flare. 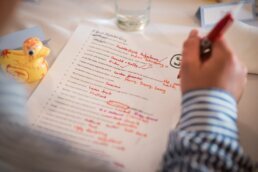 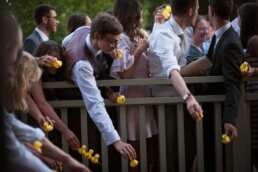 Following the duck theme, during the speeches a duck-based pub quiz got everybody ‘quacking’ up in laughter and in the mood for the duck race. Barney finished off the speeches amazingly by including the Barney tv program lyrics ‘I love you, you love me We’re a happy family With a great big hug And a kiss from me to you Won’t you say you love me too? 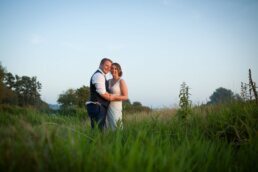 Whilst the guests finished their conversations, I quickly whisked the couple away to do some golden hour photos in a nearby field. 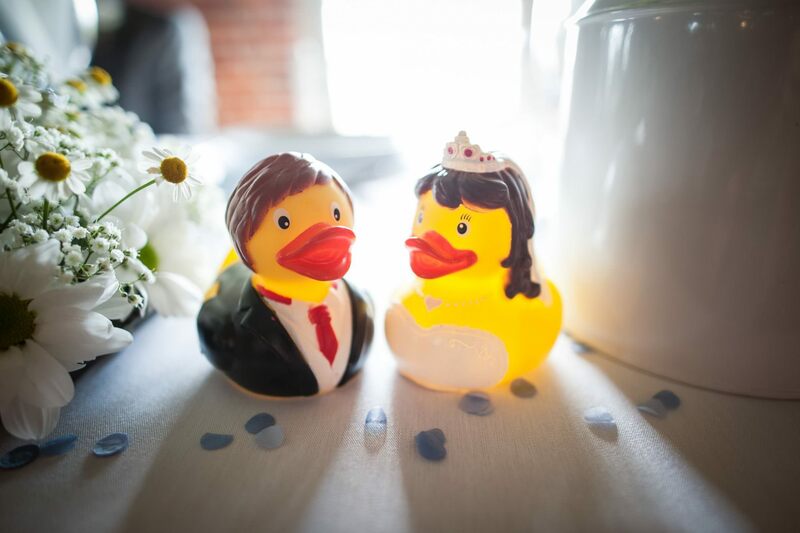 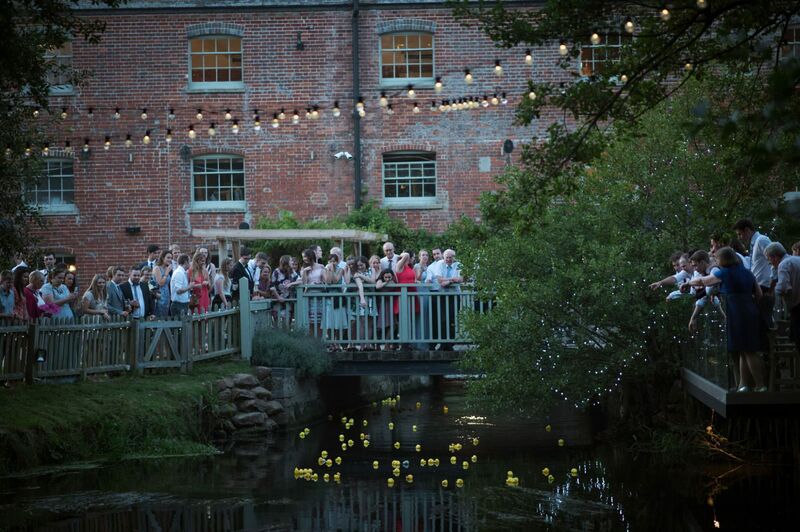 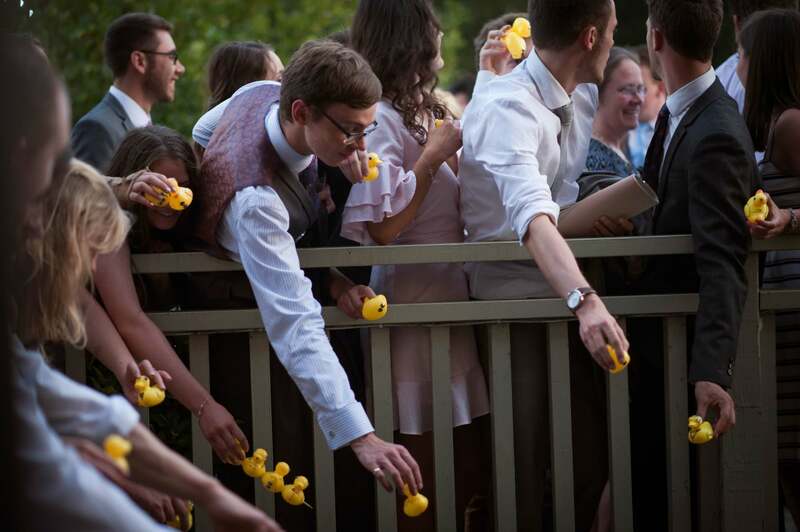 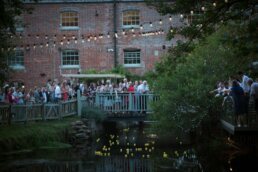 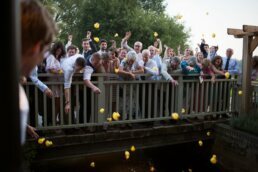 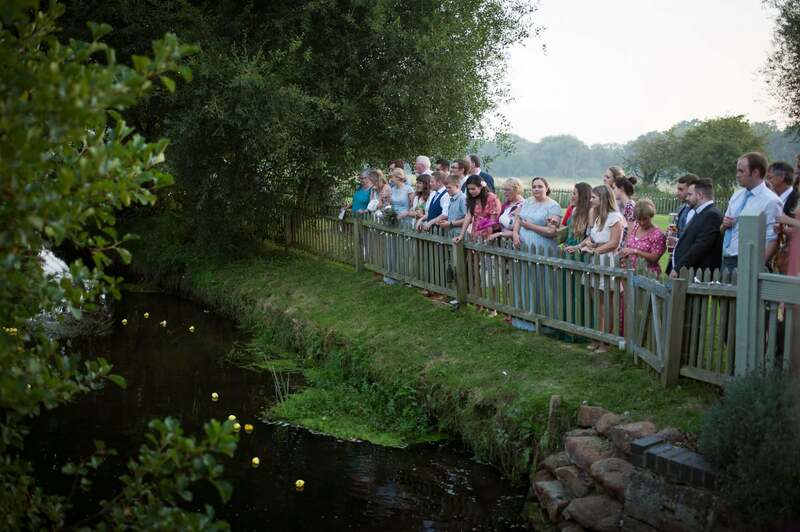 As we came back, everyone was ready to participate in the long awaited Wedding Duck Race! 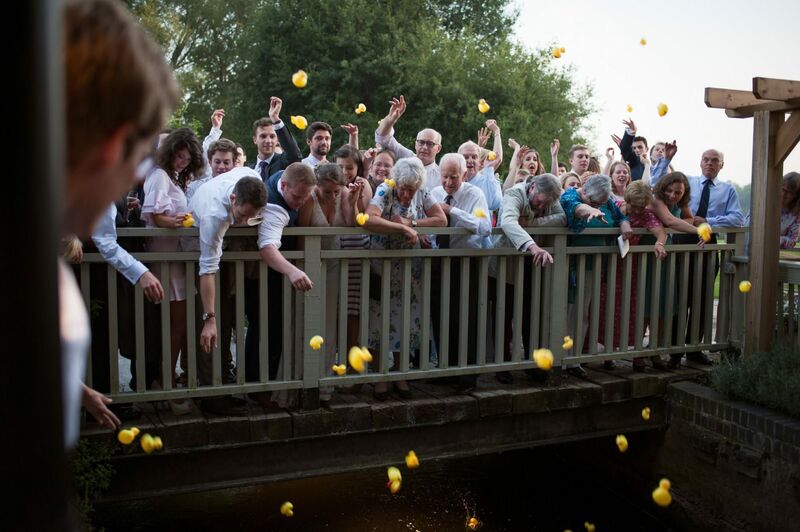 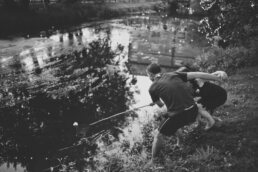 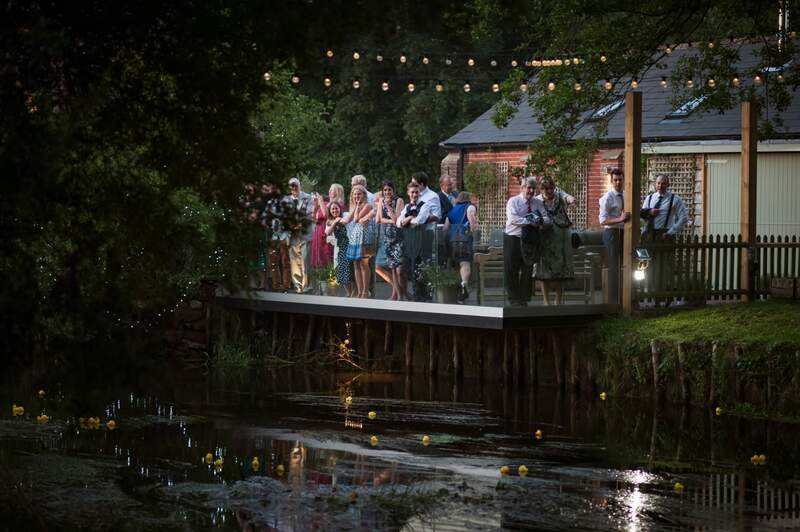 Members of the wedding party were in waders catching the ducks and lucky winner got a bottle of bubbles (I can confirm no ducks were harmed in the activity, real or otherwise). 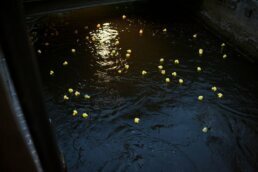 Post duck race it was time for a traditional Cèilidh and one final surprise. Forget a cake topper it was all about the car topper. Following family traditions of car decorating and the grooms love of lego the family crafted a large Lego block for the roof of the couple’s getaway car. I hope you enjoy looking through these images. 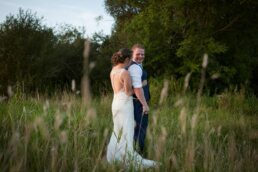 To view the rest of this special day or to order any prints, please contact the bride and groom for the gallery password. 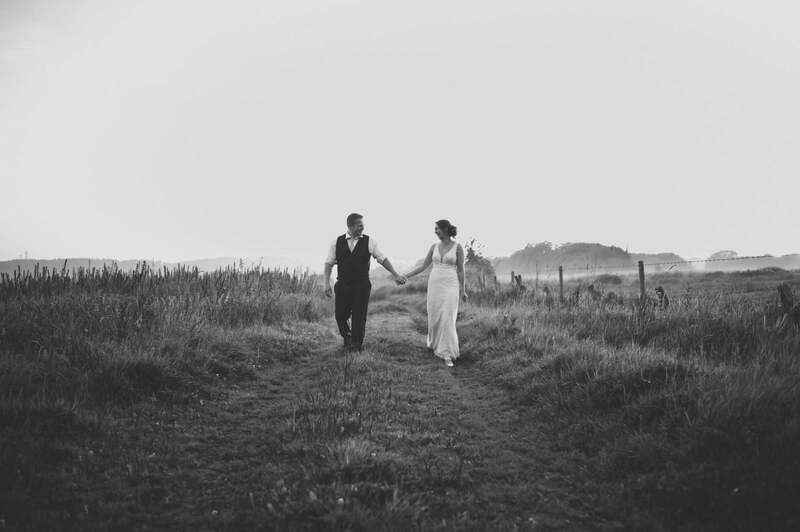 You can find their online gallery here. If you’re been looking for a Sopley Mill or Canford Magna Church Wedding photographer please feel welcome to contact me here. 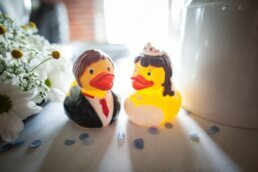 Con’quack’ulations Emily & Barney! I honestly can't recommend Rachel enough. 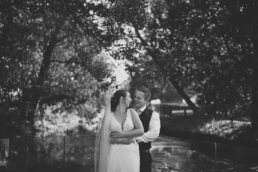 It was the quality and warmth created by her photos that made us want her to be the one to capture our special day. 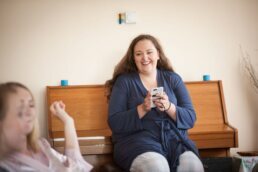 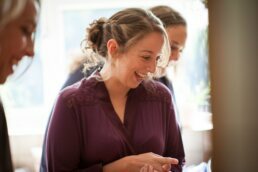 She's wonderful, calm, funny photographer who fits in like a family member, allowing her to capture natural and loving moments without anything feeling too staged. Our favourites were the candid moments that we would have otherwise missed but we're completely in love with every single photo. Thank you so much again! 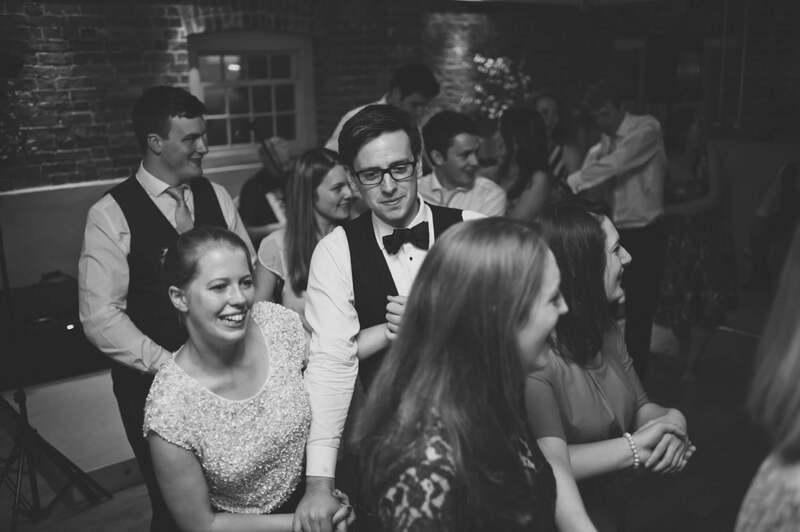 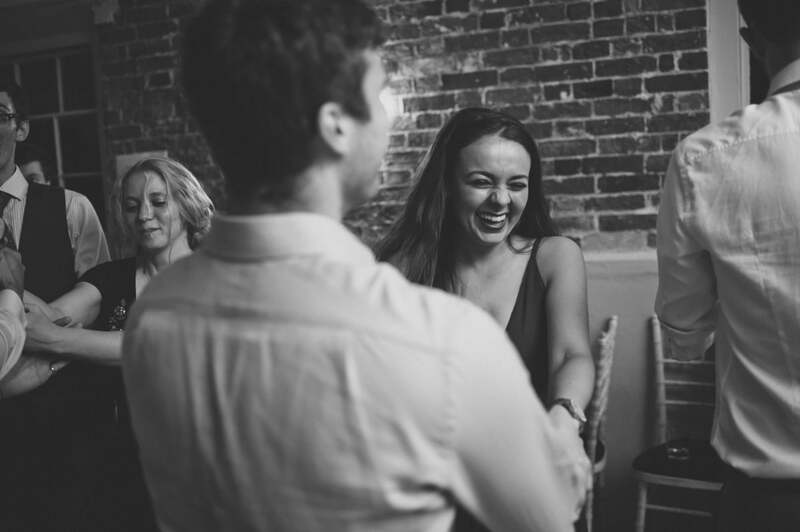 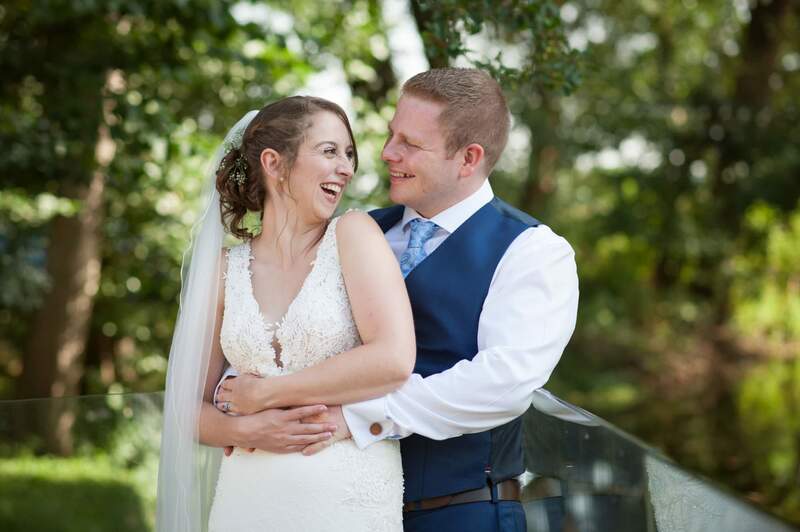 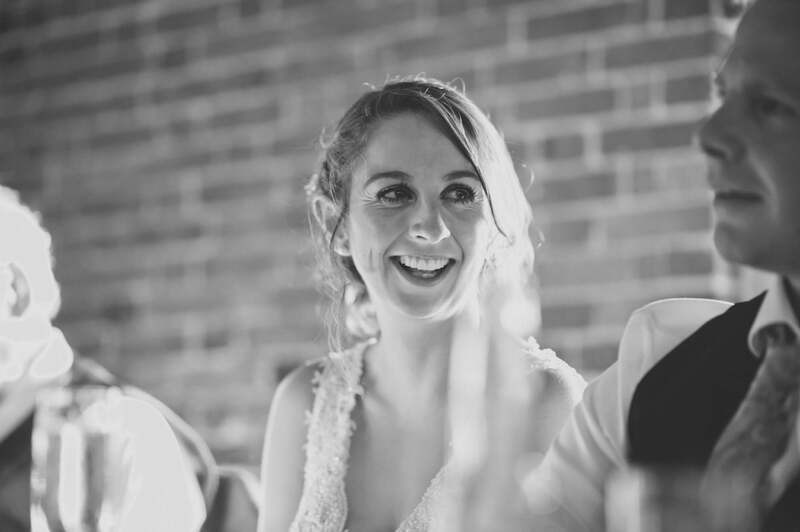 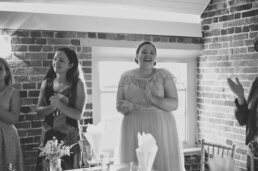 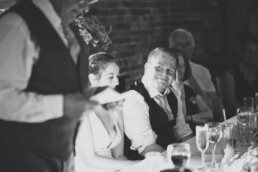 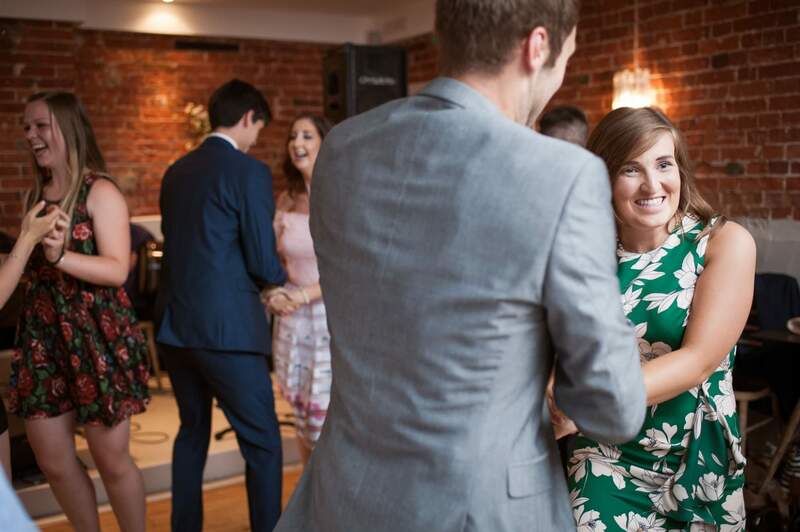 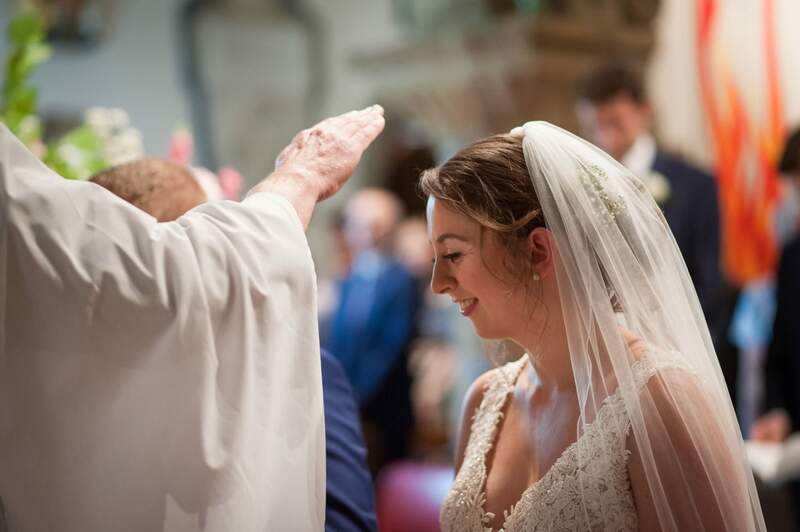 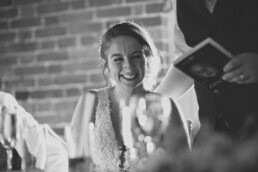 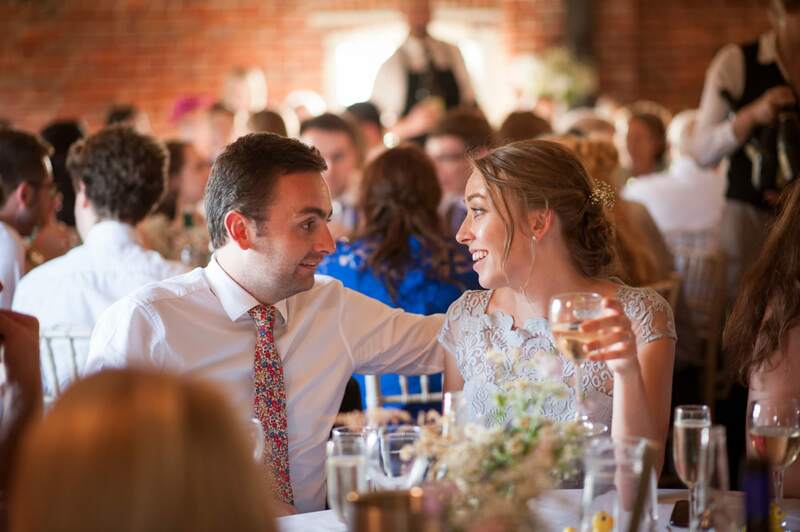 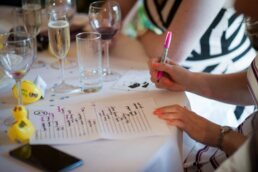 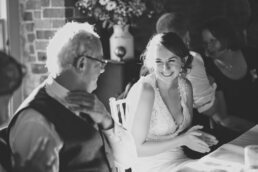 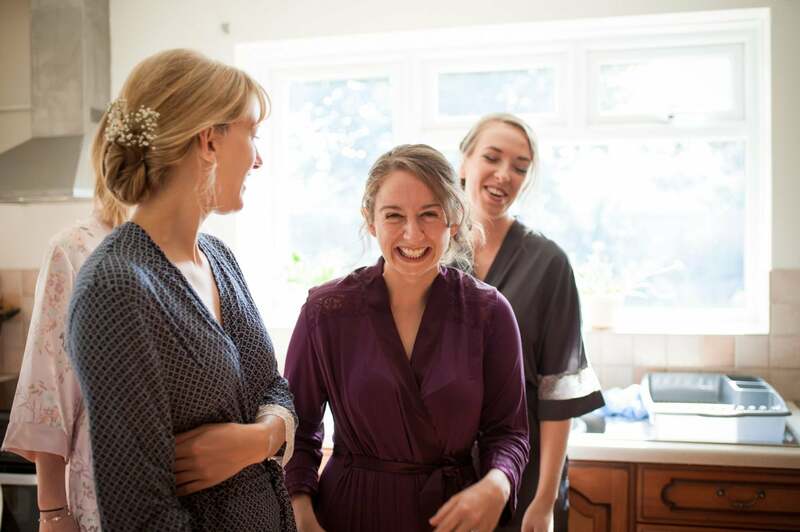 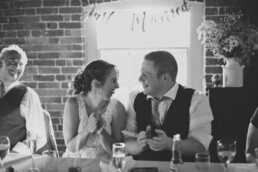 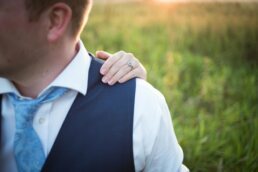 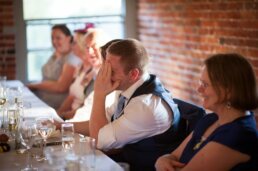 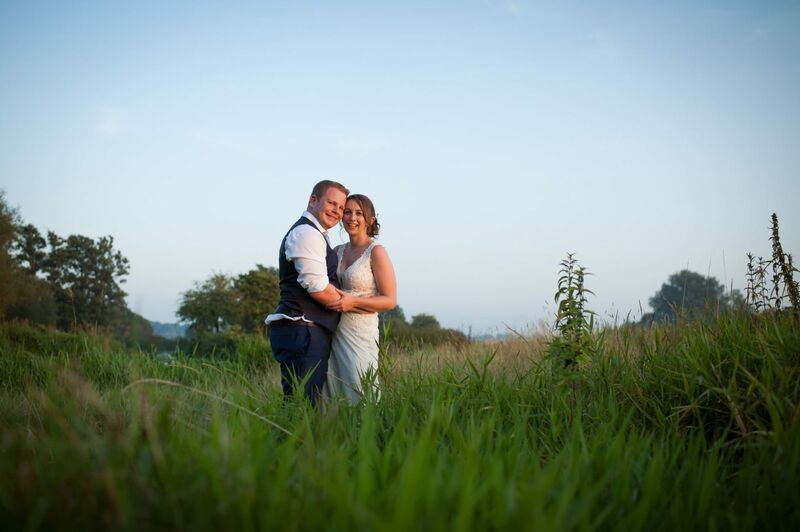 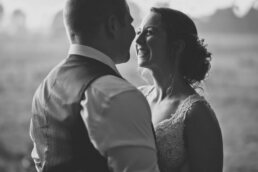 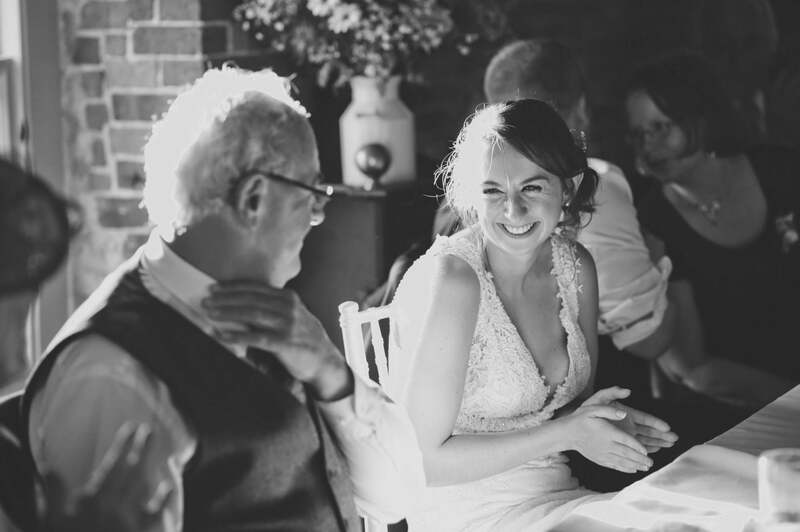 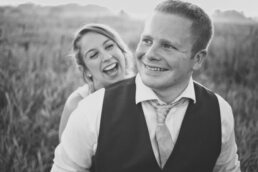 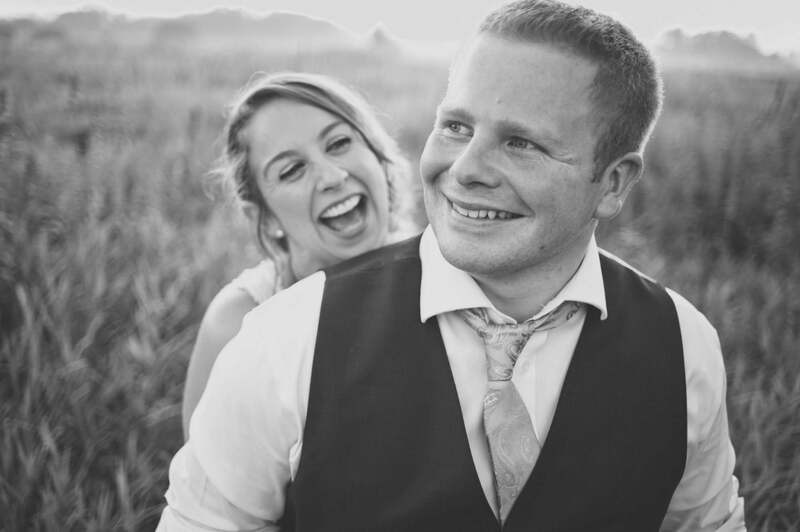 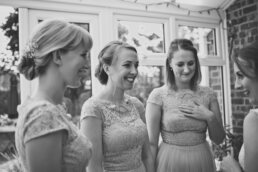 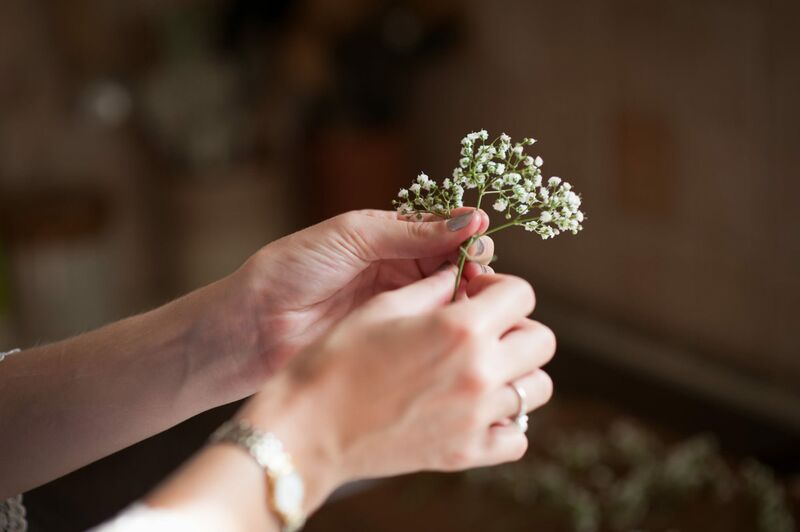 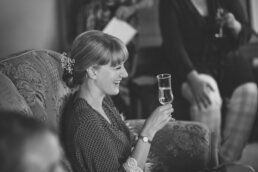 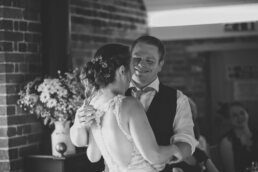 We booked Rachel for our wedding back in June and from start to end she was absolutely faultless! 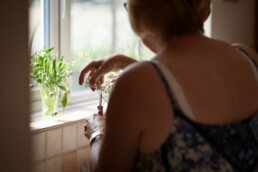 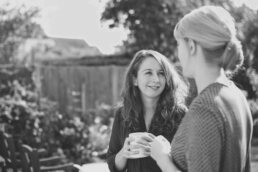 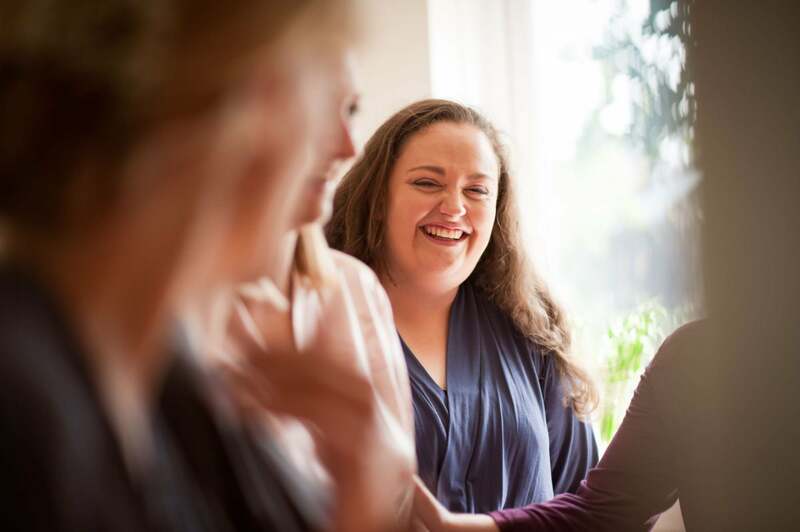 She was professional and flexible throughout the whole process and kept things clear and easy to understand for us paperwork and planning wise. 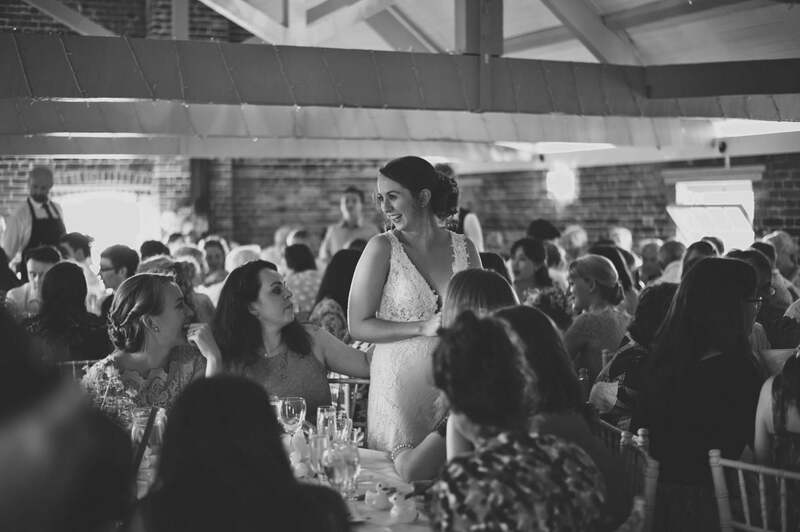 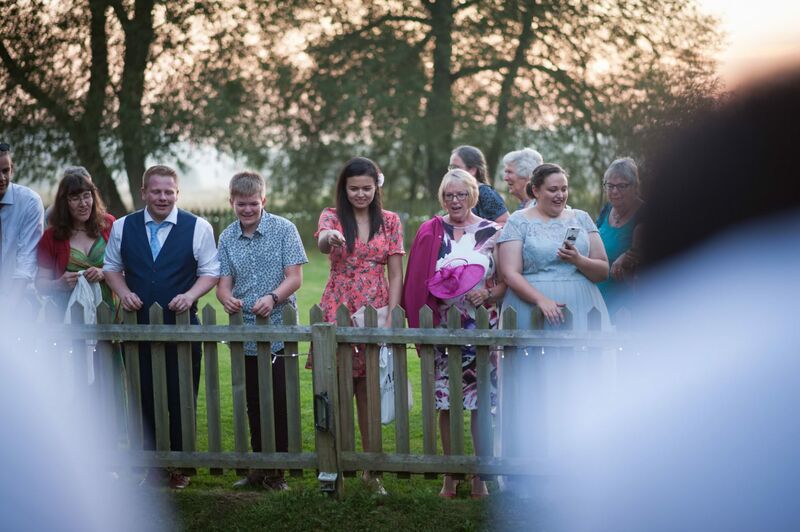 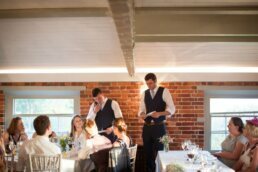 On the day there was no usual bossy photographer shouting orders at the guests, Instead Rachel was always one step ahead of the game, where she needed to be, catching all the right shots without anyone feeling 'put out' or rushed. A few people even commented "She is everywhere at once that photographer"
Rachel did a bump shoot for me when I was 7 months pregnant. 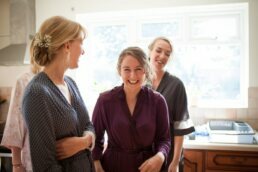 The photos she produced were lovely & have given me a beautiful & lasting memory of my pregnancy. 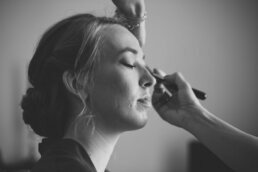 I really enjoyed the shoot, normally I'm not a fan of being photographed, but Rachel was professional & she made me feel so comfortable. 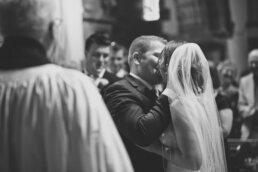 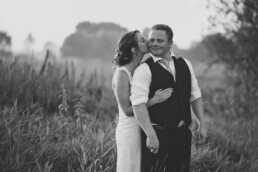 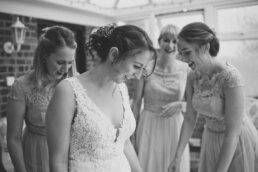 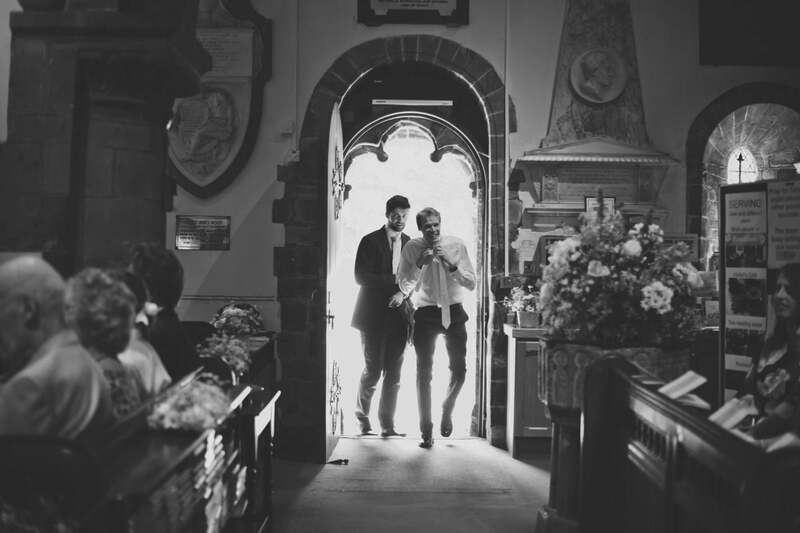 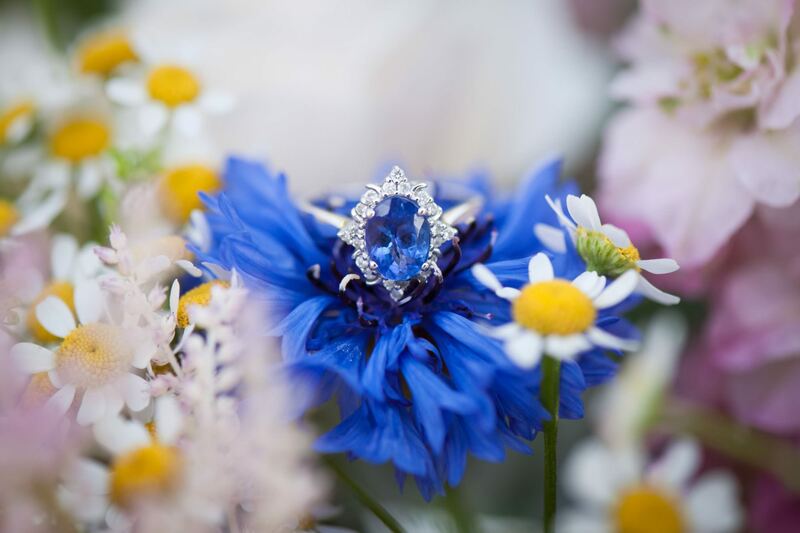 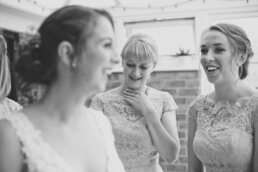 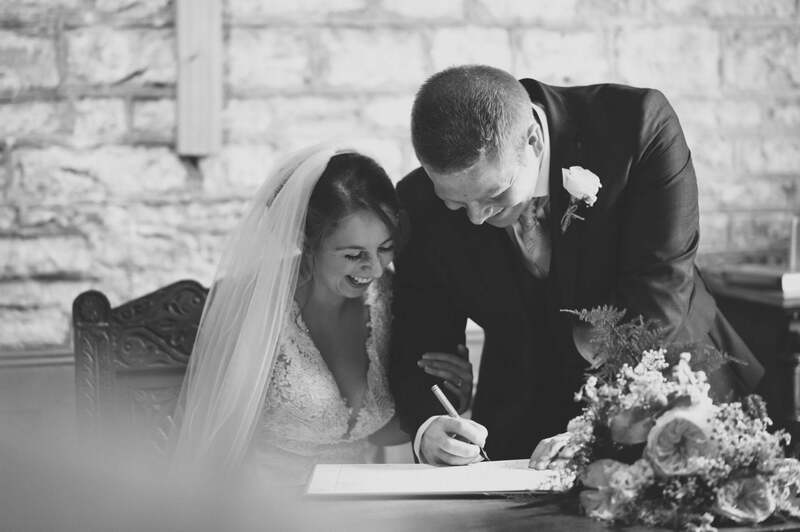 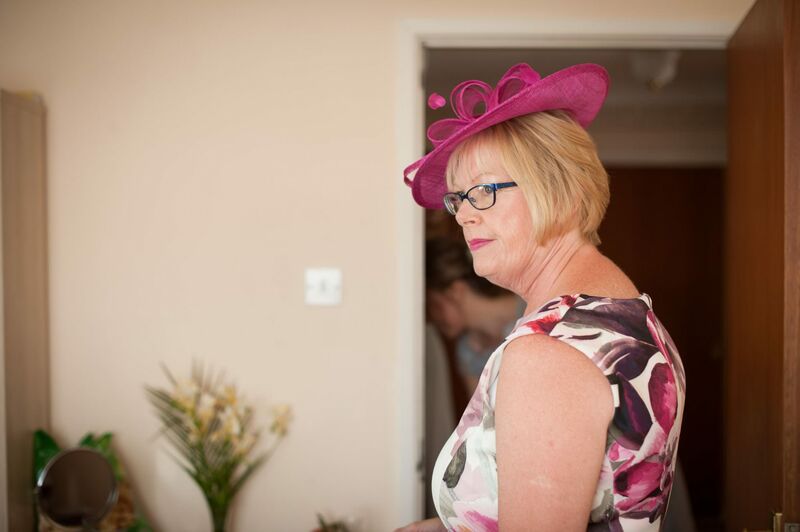 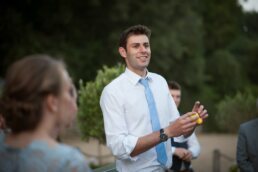 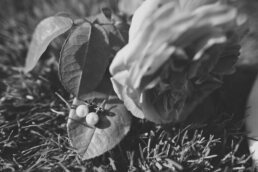 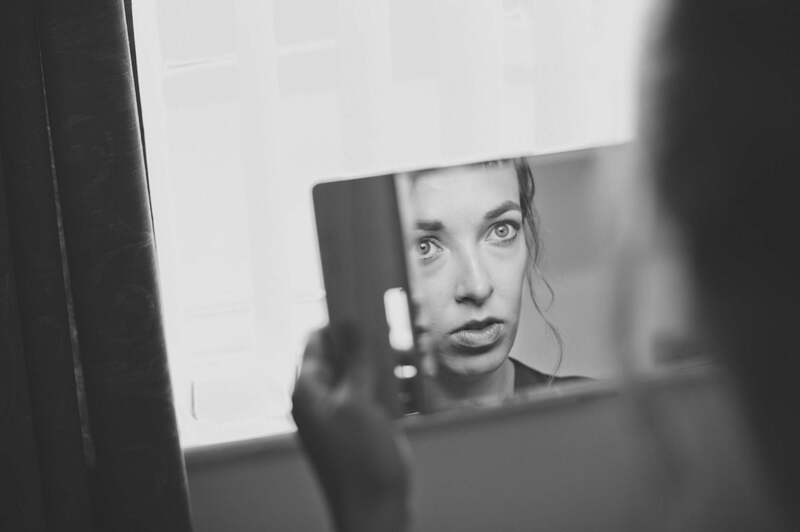 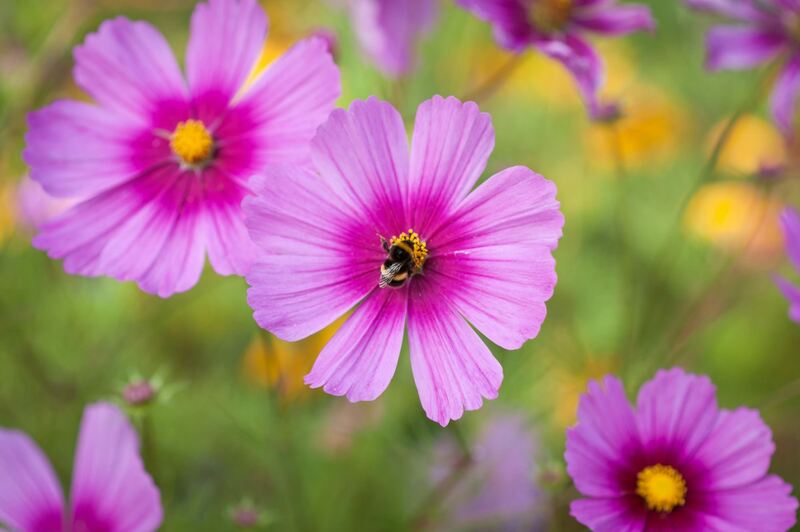 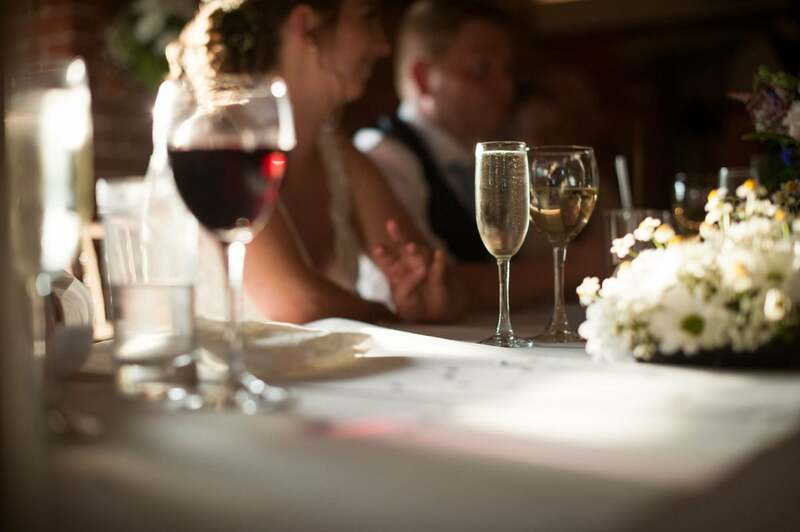 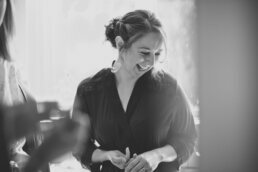 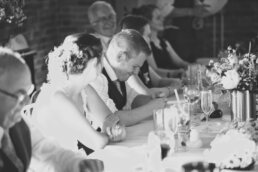 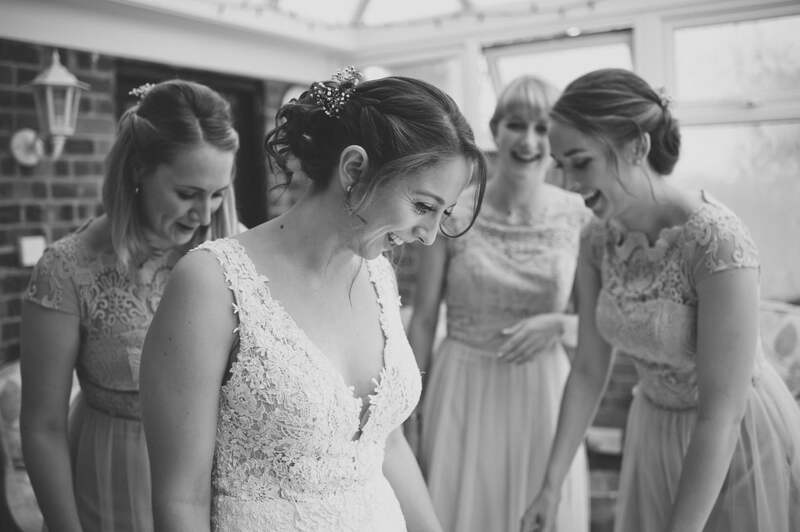 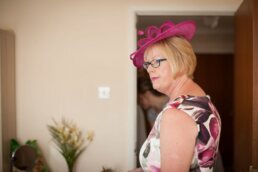 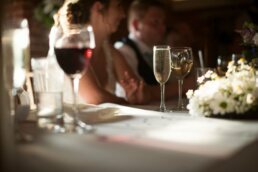 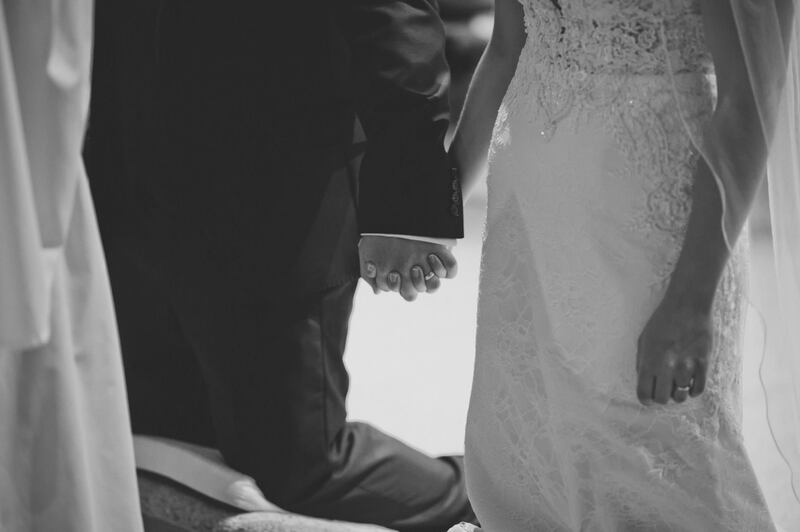 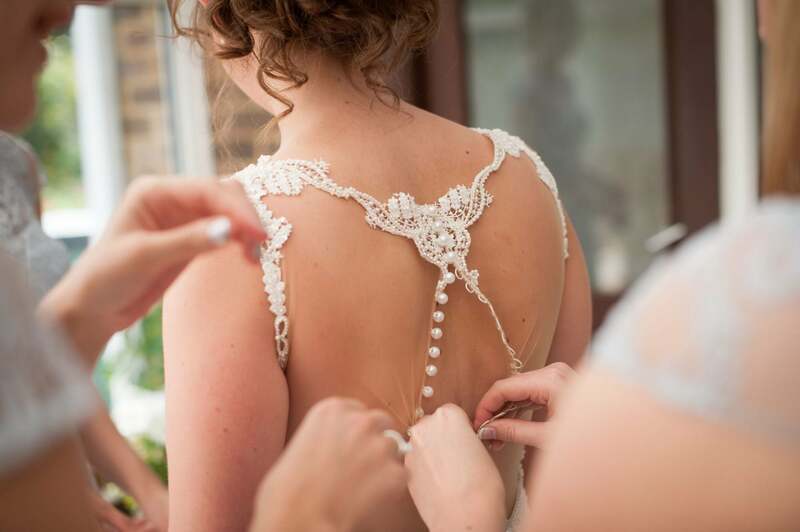 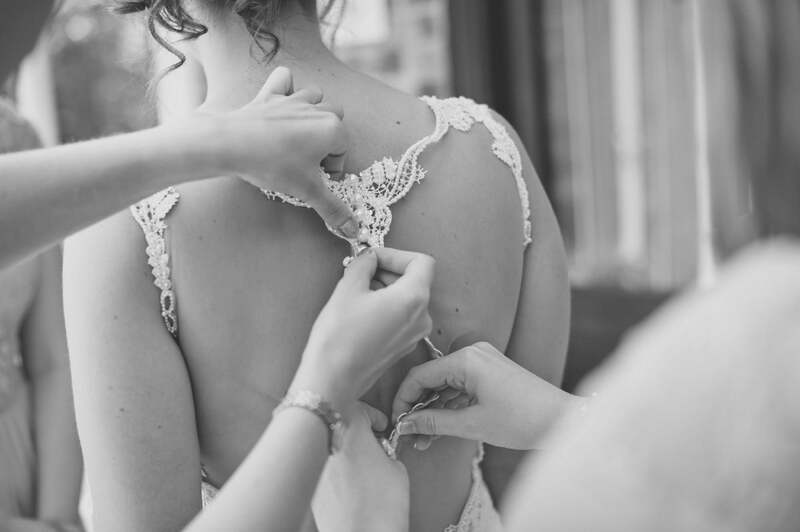 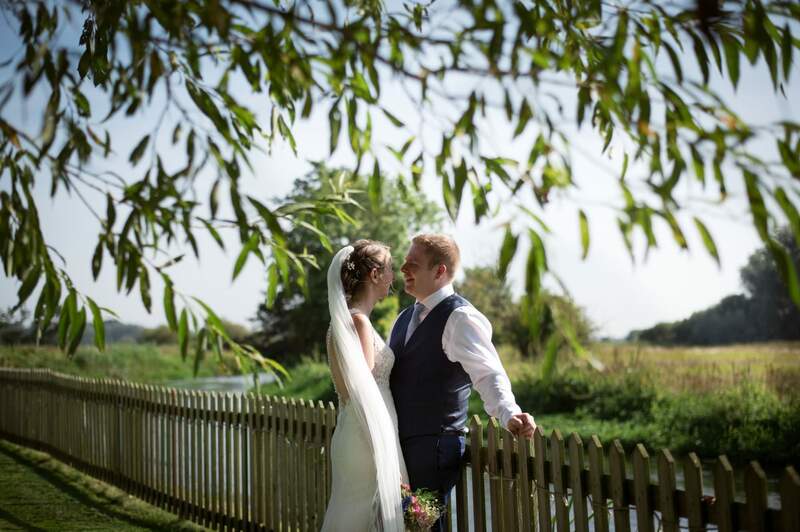 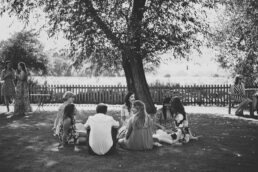 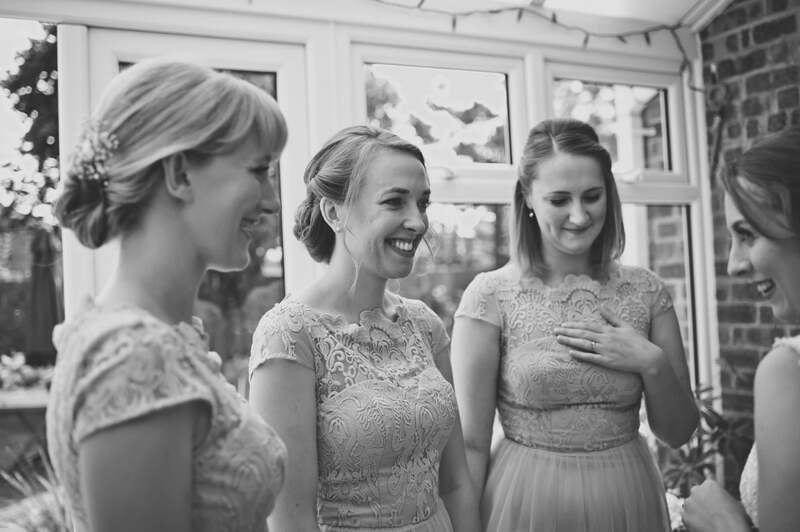 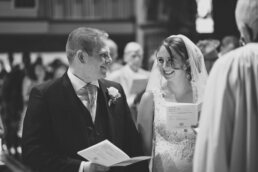 Rachel has an impeccable eye for detail & clearly strives to take striking, creative images. 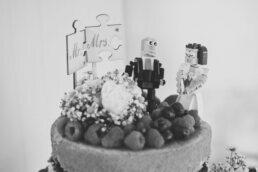 Our cake smash pictures of our daughter when she turned one were amazing!! 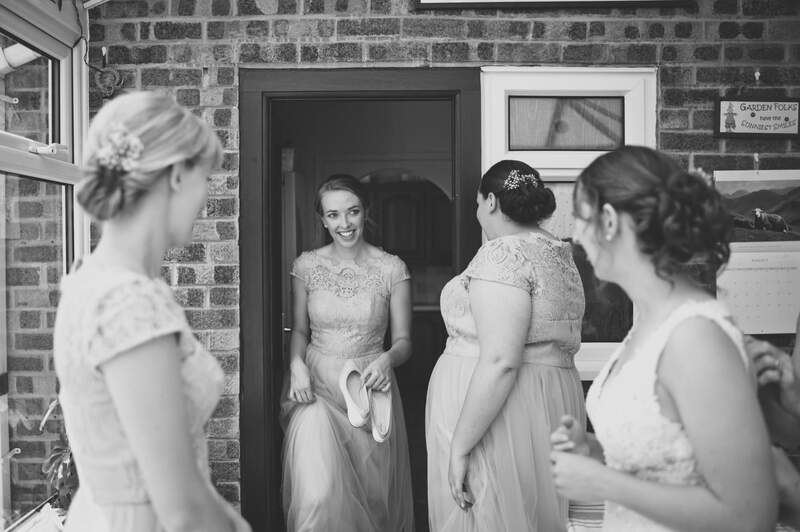 We were so pleased with how relaxed Rachel made us all feel. We've since used her for a lovely Christmas shoot of all three of our children and now looking forward to our outdoors Autumnal shoot. I would highly recommend this very talented young lady! 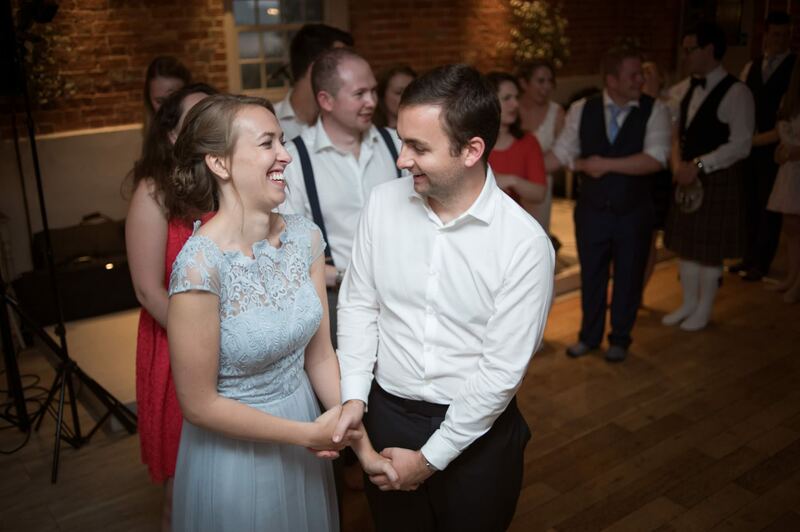 Rachel is wonderful! 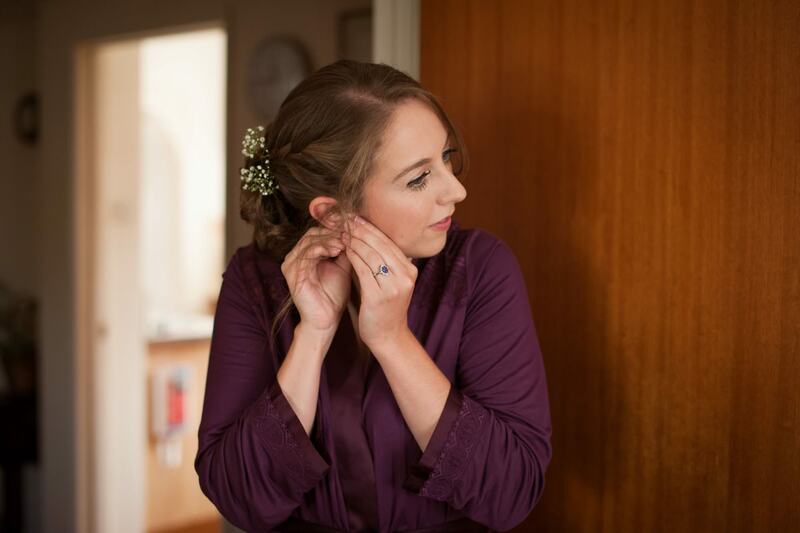 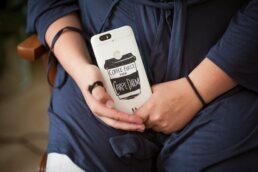 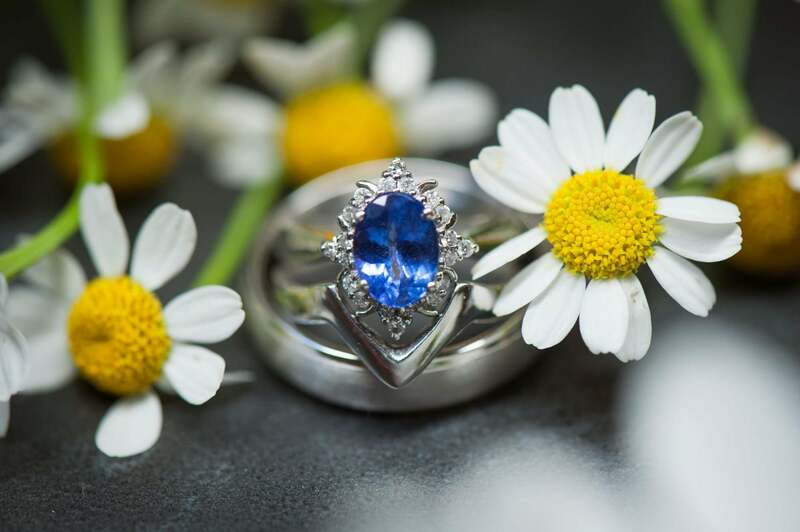 I run a small business and I have booked her to do all my product photography on an ongoing basis. 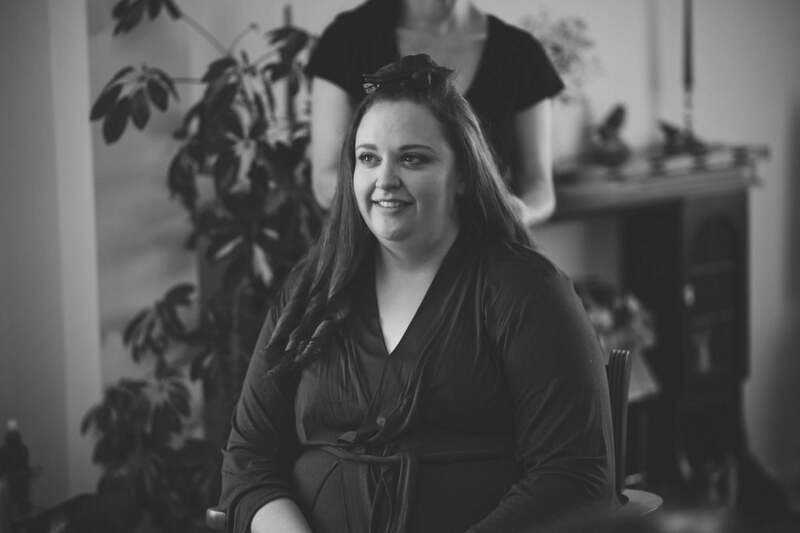 She has a beautiful style that works perfectly alongside my brand, and she delivers incredible images that help so much in creating the vital first impressionfor online shoppers. 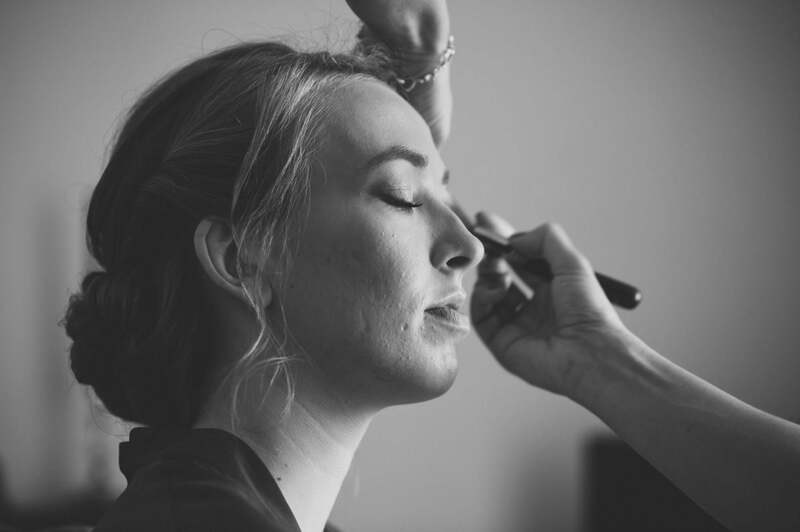 She's incrediblyprofessional, creative and full of suggestions, and an absolute pleasure to work with. 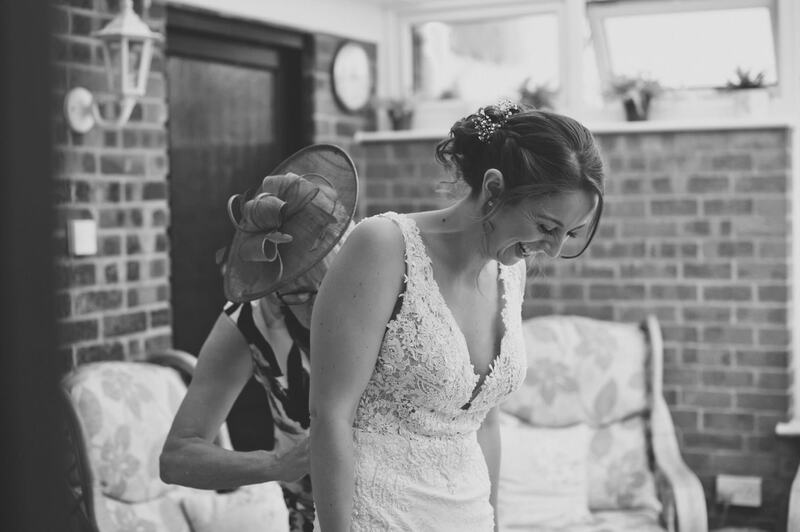 I can highly recommend her. 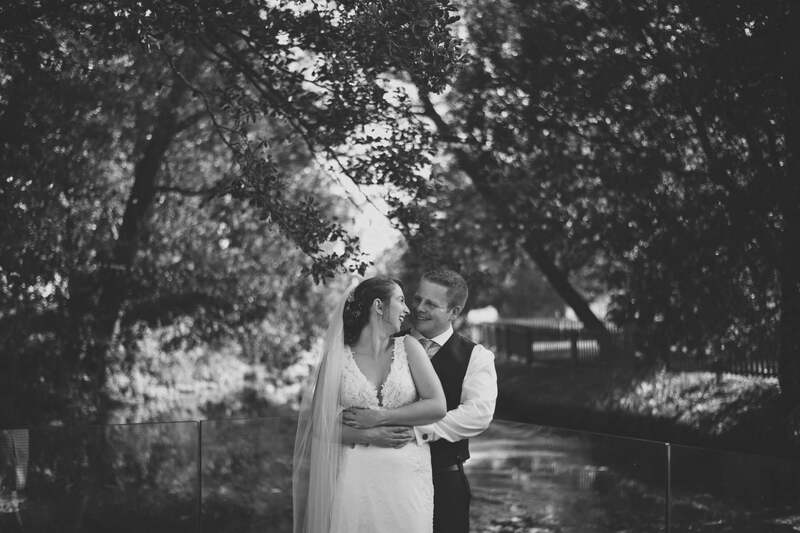 We had the most amazing family shoot in the forest. Rachel was very good in helping guide the shoot in terms of locations and setups. The end results were fantastic, we couldn't have wished for better!! Thank you again!! Many of our friends and family commented on how professional, friendly and quick she was. 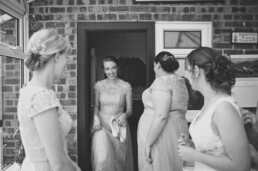 I can definitely vouch for her efficiency; at previous weddings I've been too it's felt like the bride and groom are posing for hours while the photographer lines everyone up and adjusts their camera multiple times - just for a few group - but Rachel quickly (but not rushed way) got the required shots for the group photos we'd planned in advance, so we could get on with enjoying ourselves and relaxing into the evening! 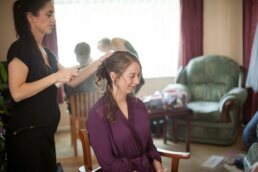 Our whole day was very relaxed and Rachel definitely helped with that! As for the photos, they are everything we had hoped for, all absolutely brilliant!! 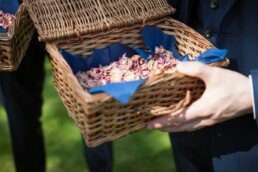 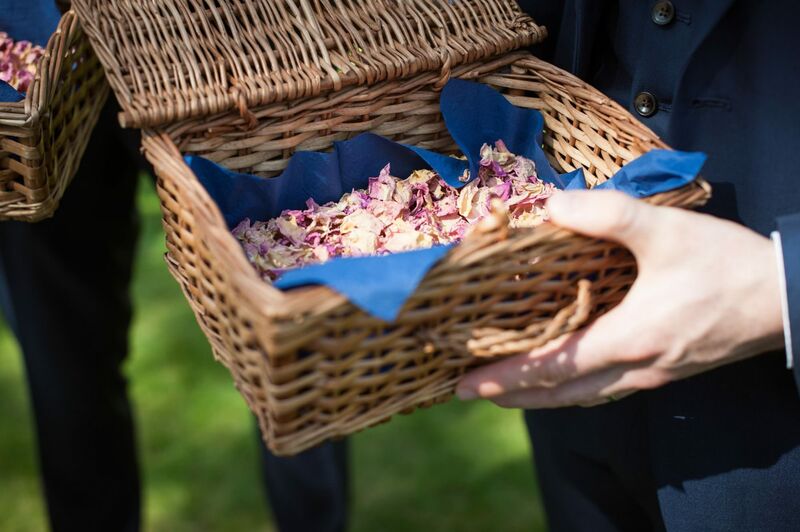 With a consistently excellent quality and feel to them - presented to us in a beautiful wooden box, a real treasure to keep forever! 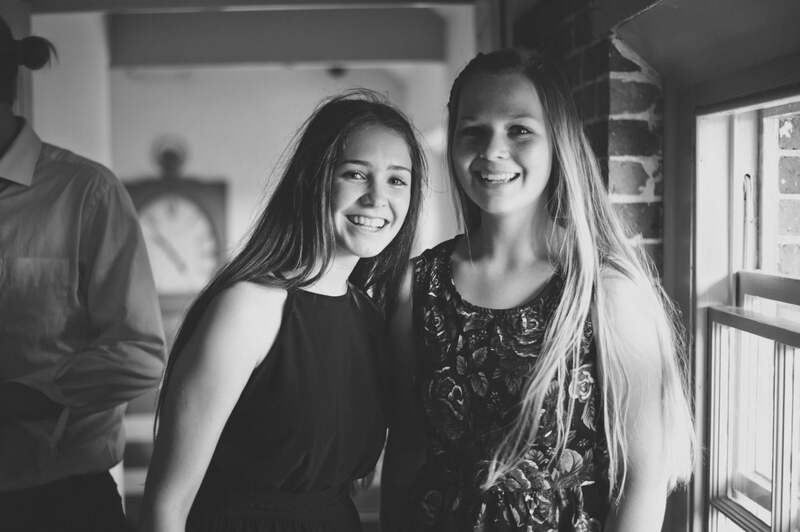 Thanks Rach, you rock!! Rachel is an amazing photographer! 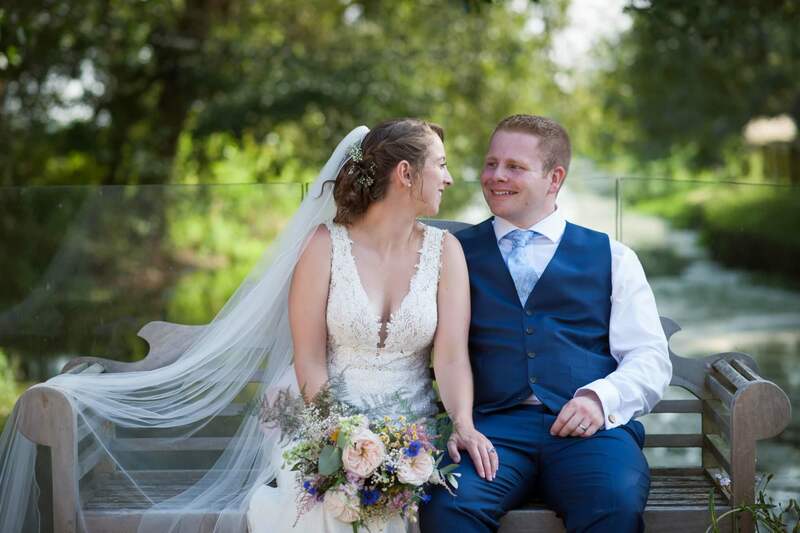 She captured our wedding day perfectly and has supplied us with so many beautiful photos it will be difficult to chose the ones we want to put on our wall! 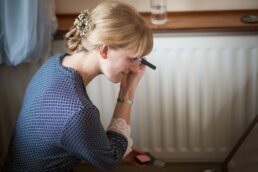 On the day Rachel was friendly and clam and fitted right in that you didn't notice she was there snapping away. When doing the group and couple shots Rachel gave good directions to get the great shots. Thank you again, I can't recommend your work highly enough!